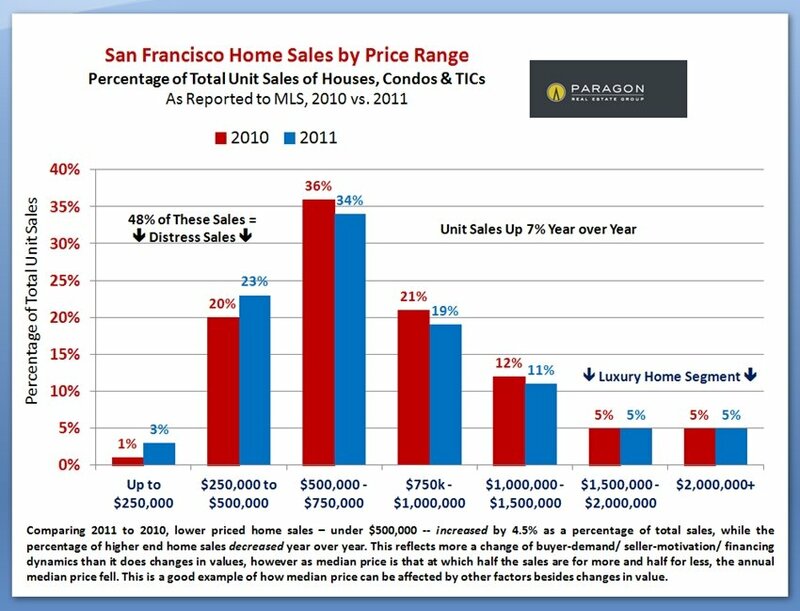 There is so much drama in the San Francisco homes market right now that it is difficult to decide which statistics to present in our current newsletter. 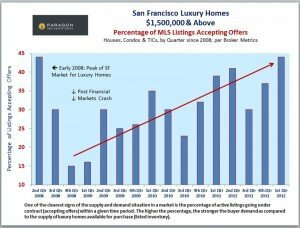 The supply and demand situation – huge buyer demand and extremely low inventory of homes available to purchase – has created the most ferociously competitive environment for buyers, and the best environment for sellers, in many years. 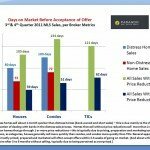 This has been building since the market began turning in 2011, made a quantum jump in early 2012, and is now showing up in big increases in sales prices. 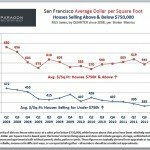 Though certain neighborhoods spearheaded the recovery and are currently showing the most dramatic changes in values, pretty much all the city’s neighborhoods are now experiencing a similar supply and demand dynamic. 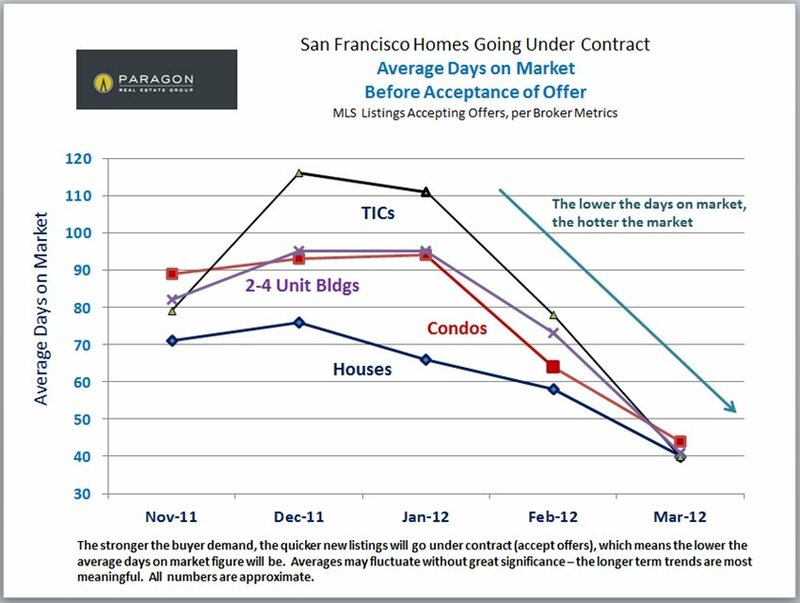 Closed sales data reflects the market heat 4 to 10 weeks prior, when the new listings arrived on the market and accepted offers were actually negotiated. 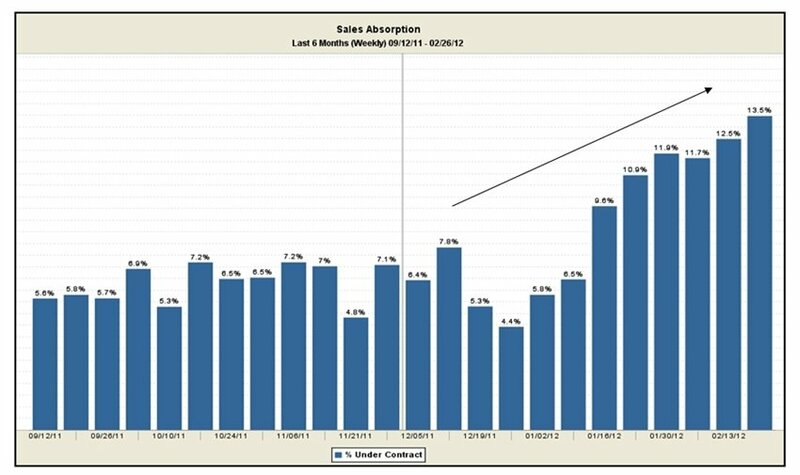 Thus the April/May spike in values mostly reflects the market in February, March and early April. If anything, the market has only become hotter since then. In past years, the market has usually slowed down during the summer months – we will see if that occurs in 2012, or whether the current trend continues. 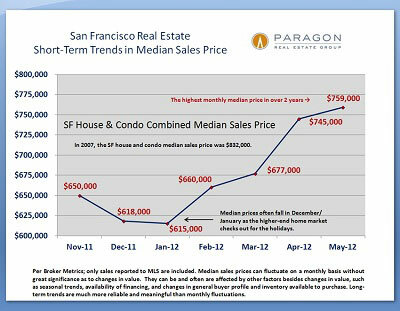 Median and average sales prices are calculated in different ways, and each has its advantages and weaknesses as a statistical measure. 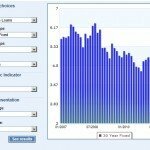 Any statistic is a generalized, market-condition snapshot taken from a specific angle on the data. 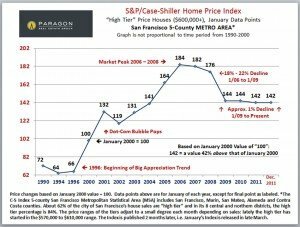 Ideally, different statistics should all point to the same conclusion regarding market trends, which is what we’re seeing below. 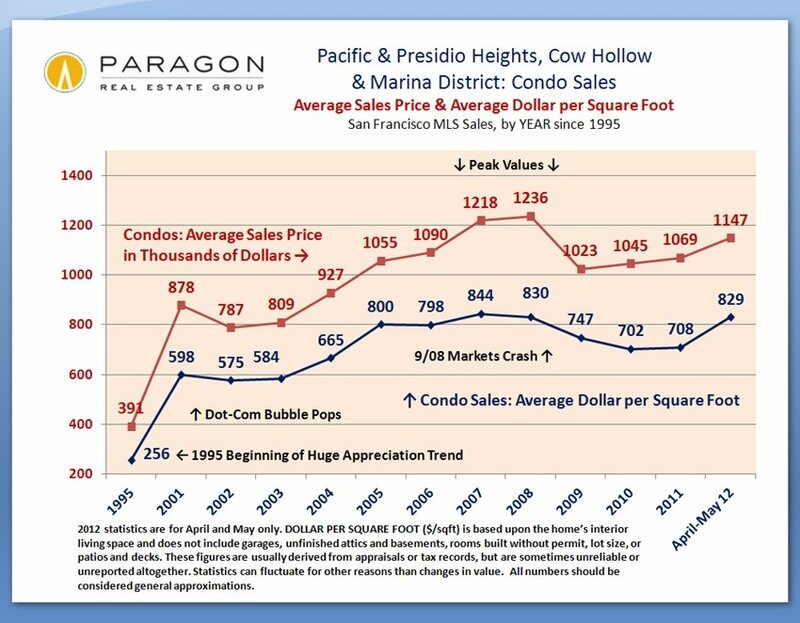 By some measures, property values, at least in April and May – which is a very short statistical period of time – are rapidly approaching peak values in 2007/early 2008. 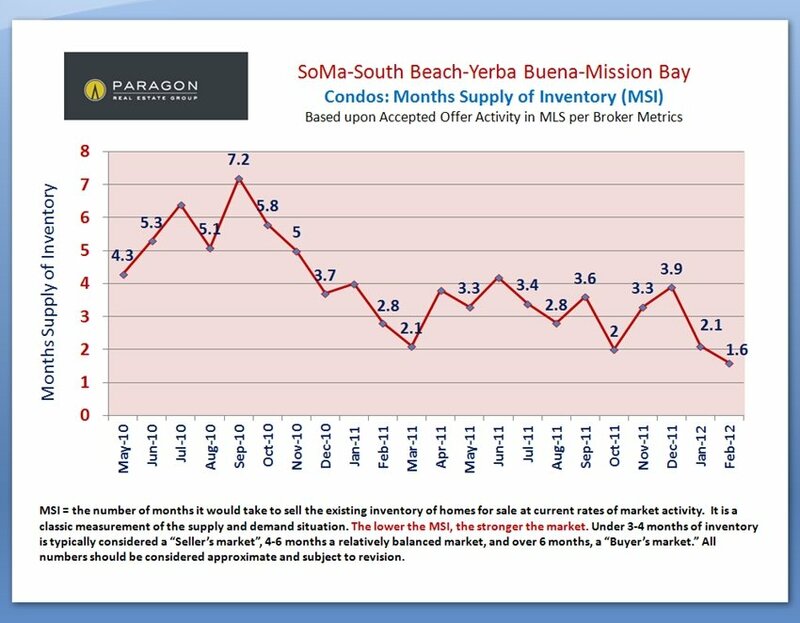 In the next couple quarters, it will be seen if this is simply a dramatic fluctuation or an initial indication of a sea change in market prices. 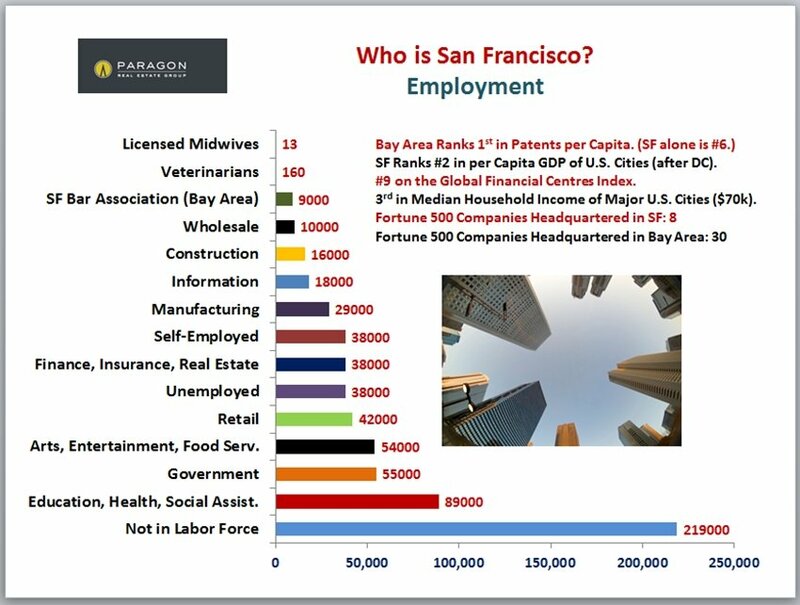 Based upon what we are seeing in the statistics and on the street, we lean toward the second view. 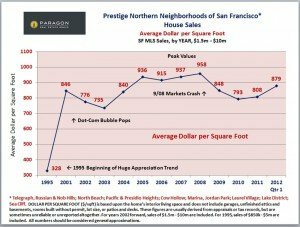 Some neighborhoods, such as the greater Noe Valley area, the greater South Beach/SoMa area and the older, prestige northern neighborhoods such as Pacific Heights and Russian Hill, have been at the leading edge of the market recovery. 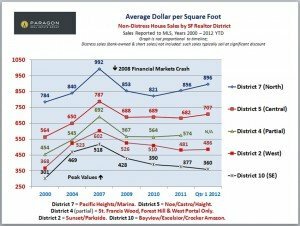 Other areas, such as many neighborhoods in the southern districts of the city, are a step behind and price increases have not yet shown up as dramatically in the statistics. But we believe they will very soon: the markets there have become very hot as well. 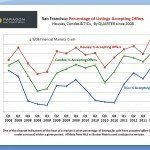 Distressed home listings in San Francisco are rapidly declining by units and as a percentage of the overall market, and as home values and home equity increase, this trend will continue. 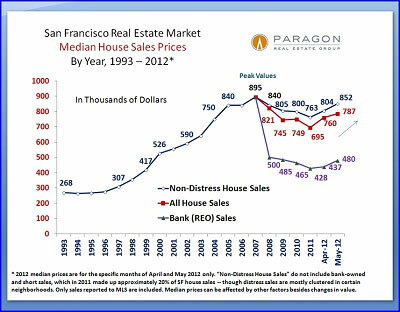 Since distressed home sales have a negative effect on values, this dwindling will continue to strengthen the market. 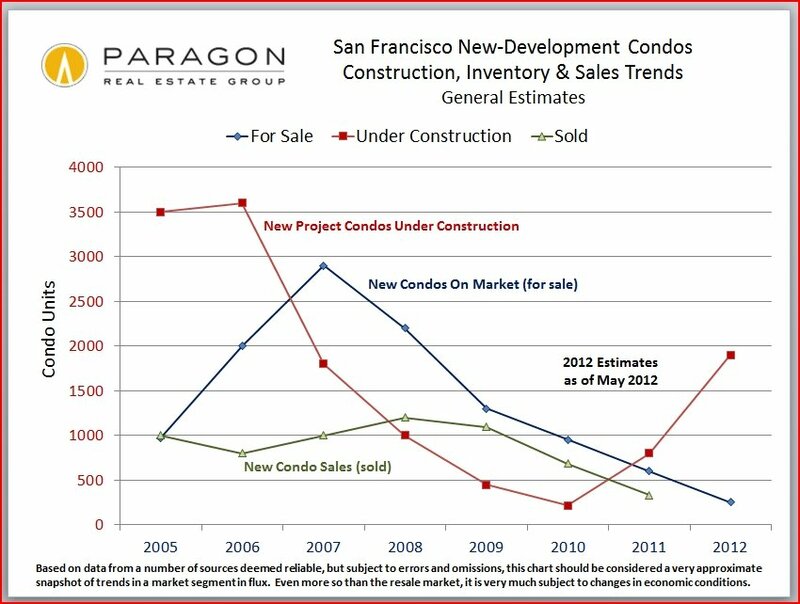 Another important dynamic is the crash in new-home construction 5 years ago and the resultant reduction in new homes (mostly new condos) now available to purchase. 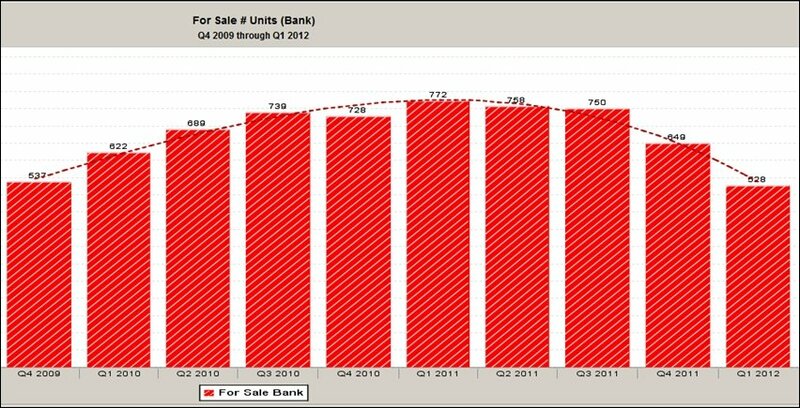 As these units are highly sought after, this adds to the crunch in supply and the upward pressure on prices. 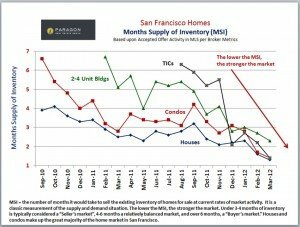 As the city’s economy and housing market has recovered, builders are jumping back into the market in a big way, but there is a significant lag time between the decision to build and the acquiring of permits and having new condos ready to sell to eager buyers. 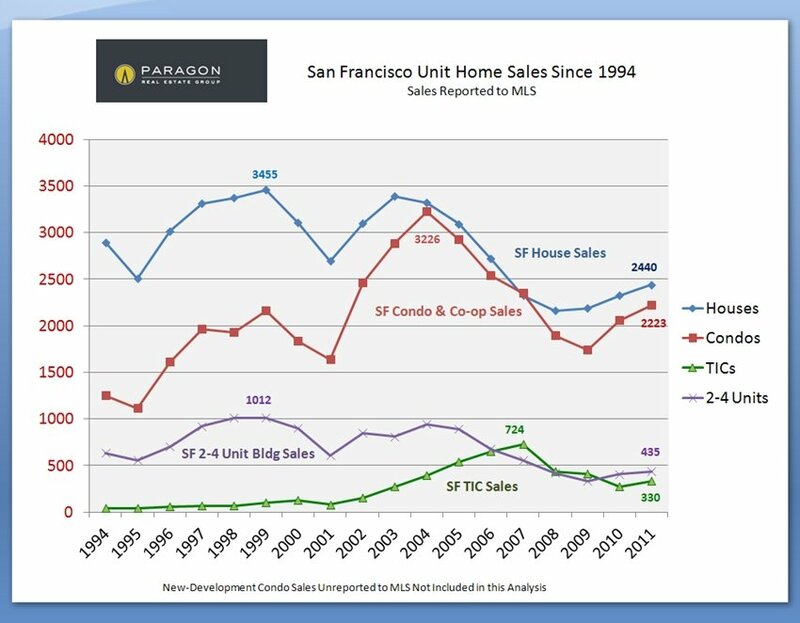 Units for sale and Months Supply of Inventory: Probably at their lowest in decades. 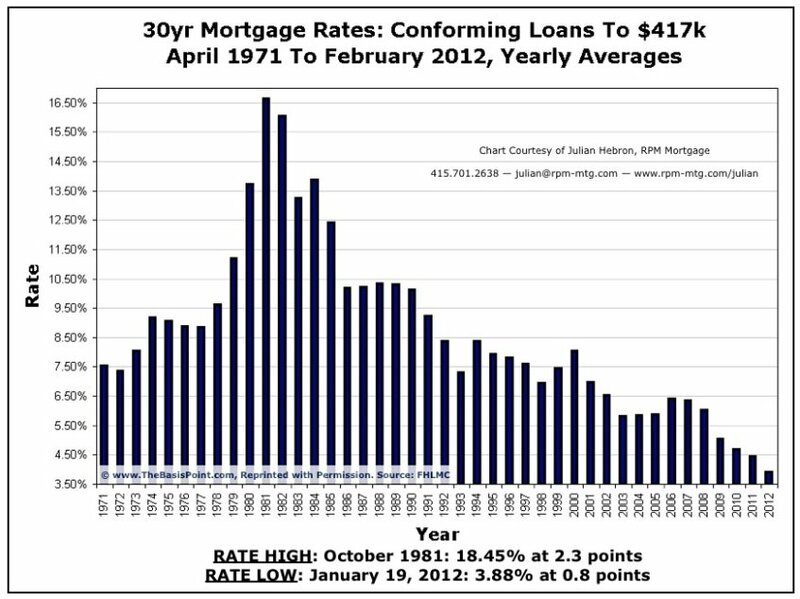 In many ways, this is the single clearest statistic regarding what’s going on in the market. 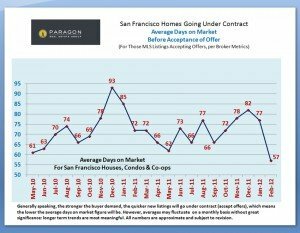 Average days on market have also plunged in May. 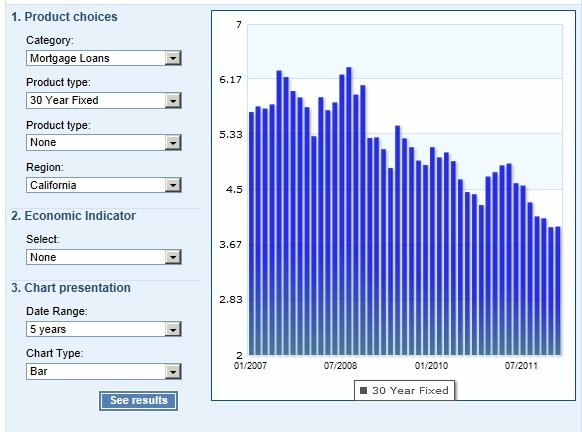 Interest rates just hit another historic low. Someone buying the same priced home now as in 2006-2007 would have a monthly mortgage payment approximately 25% lower. 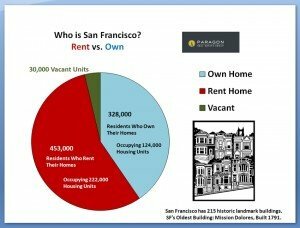 The Rent vs. Buy equation in the city has changed dramatically as interest rates have dropped and apartment rents have soared. 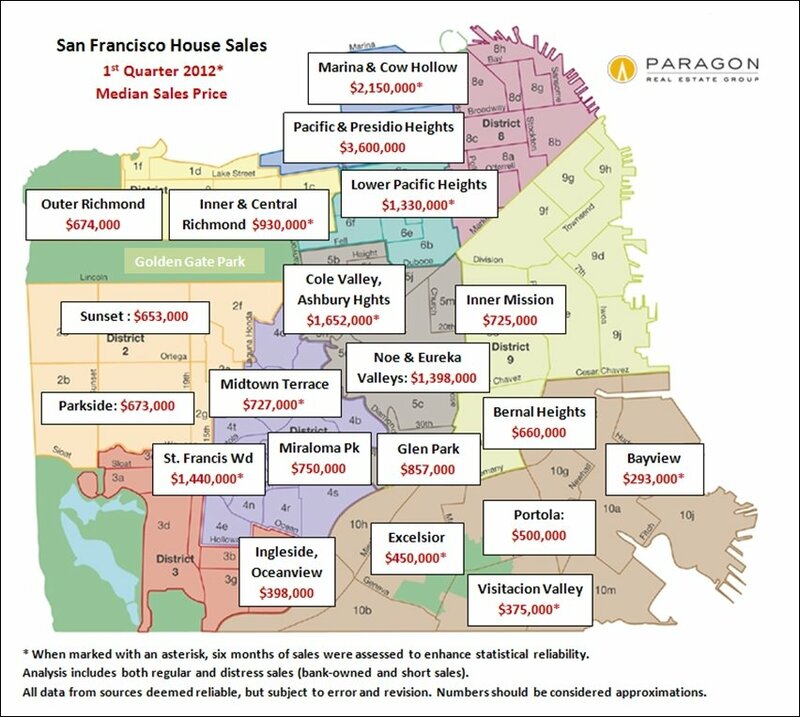 Here are 3 mapped analyses of recent SF home sales by median sales price and average dollar per square foot. Even quarterly statistics can fluctuate within neighborhoods without great significance, because in every quarter a different basket of relatively unique properties sell. 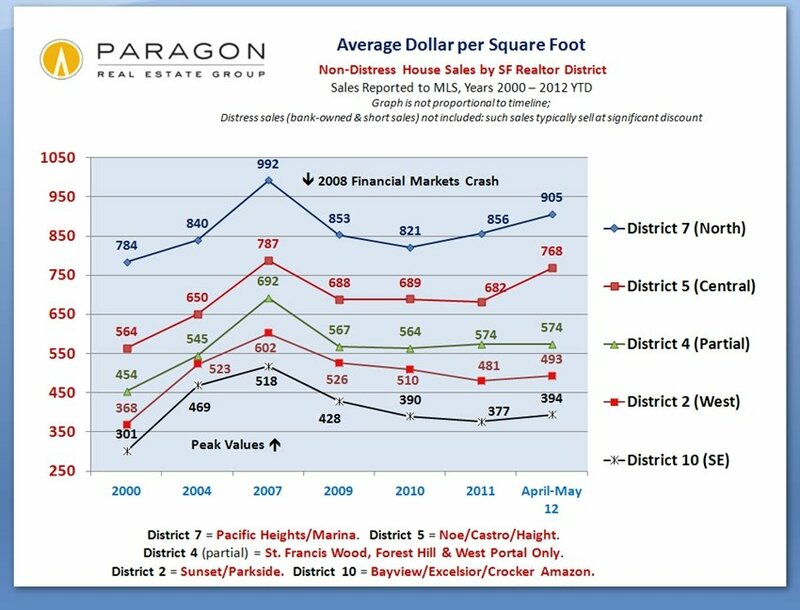 However, these maps still give an interesting overview of prices and values in the different areas of the city. Under the maps, you will find a sampling of specific 2012 San Francisco home sales. 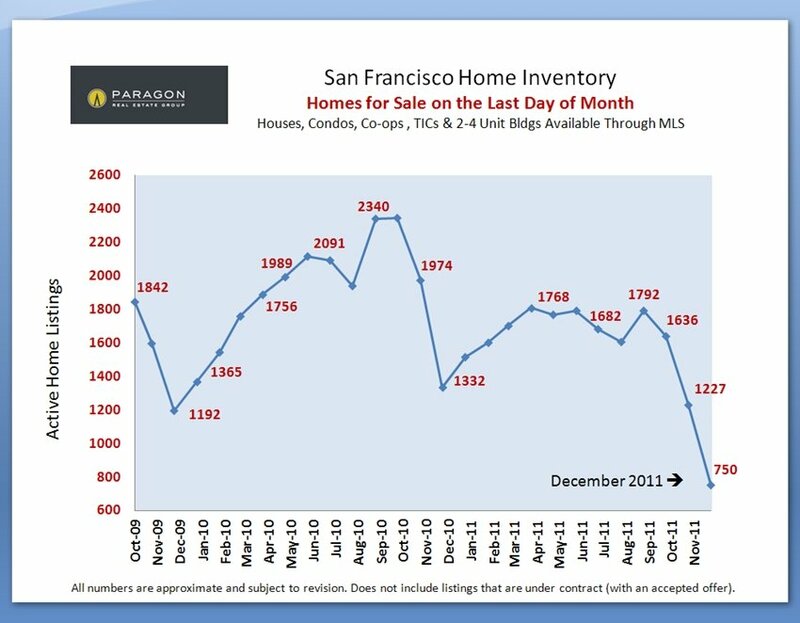 Below is a sampling of specific 2012 San Francisco home sales closing before April 30. The short descriptions can only give a very general sense of the location, emotional appeal, quality, condition and amenities of each property, and the sales listed are not necessarily representative of typical values for the neighborhood and property type. 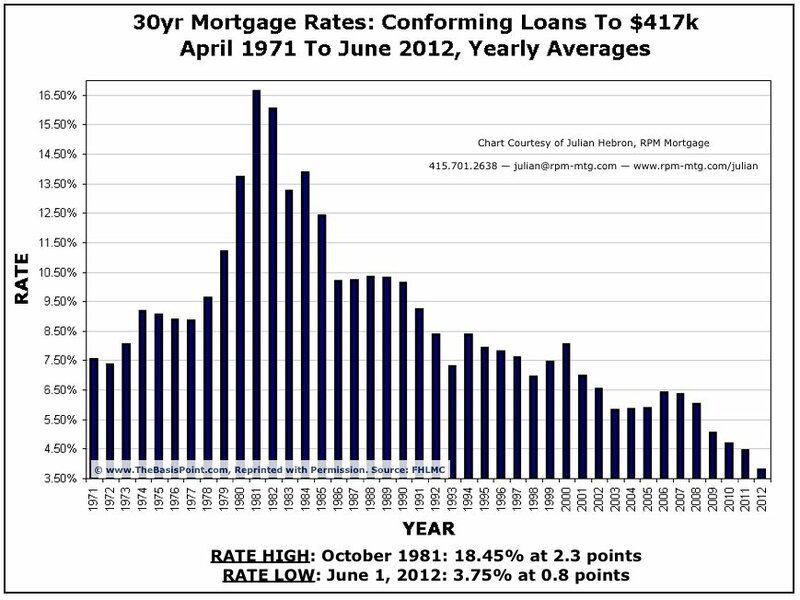 As always with real estate, the devil is in the details. $11,000,000. 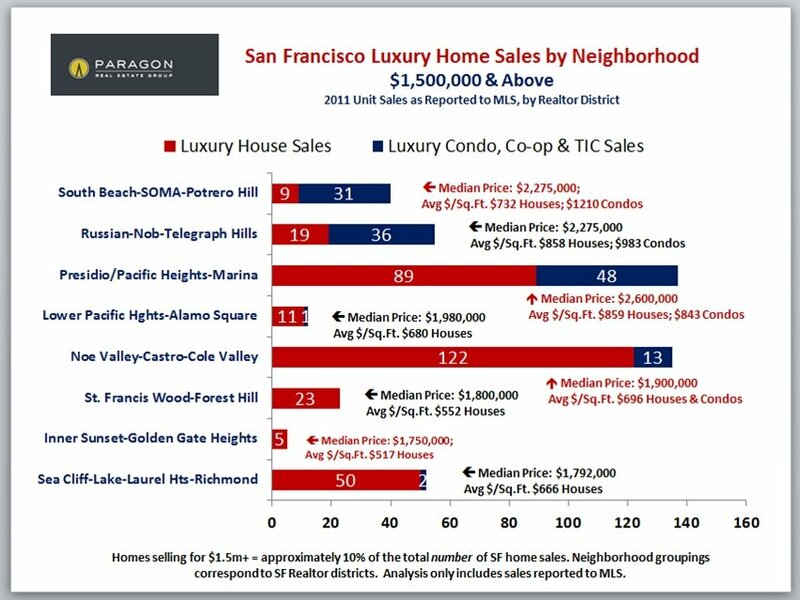 Pacific Heights on Broadway: 1904, 7 bedroom, 6 bath, Gold Coast mansion; 9744 square feet, $1129/sq.ft., spectacular views from almost every room, 120-seat home theater, 4 car parking. Sold off market. $10,000,000. Presidio Heights on Washington: 1910, 8 BR, 7 BA, 4-story mansion; GG bridge, bay or Presidio views from almost every room, but “home is in need of work”, 3 car pkg. Original asking price of $15,000,000; 97 days on market. $7,000,000. 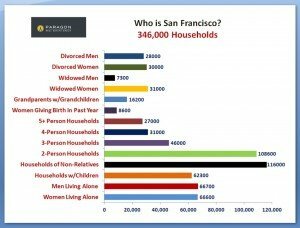 Alamo Square on Fulton: 1904, 13 BR, 14 BA “Archbishop’s Mansion”; 20,000 sq.ft., $350/sq.ft., park and city views, 6-10 car parking, elevator. 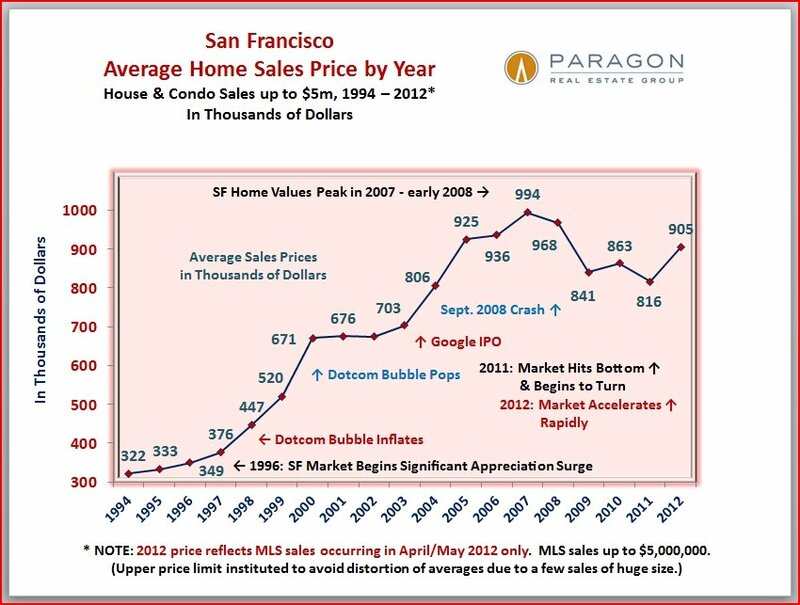 Original list price of $7,950,000; 164 days on market. $4,980,000. Russian Hill on Green: 1928, 3 BR, 4.5 BA, full-floor co-op; almost 360 degree views, doorman building, 2 car pkg, $3200/month HOA dues. 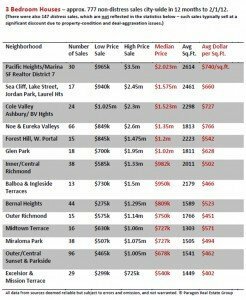 Original list price of $5,750,000; 98 days on market. 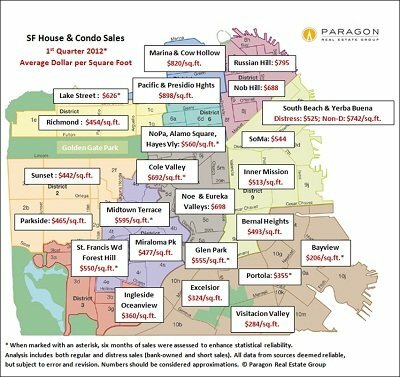 $4,795,000. Cow Hollow on Union: 5 BR, 4 BA house; 3962 sq.ft., $1210/sq.ft., large lot, pent-level with views, large south yard, 2 car pkg. Sold for 2% over asking price; 15 days on market. $4,650,000. Telegraph Hill on Montgomery: 5-level, 2-condo building (4400 sq.ft. main residence; 1021 sq.ft. 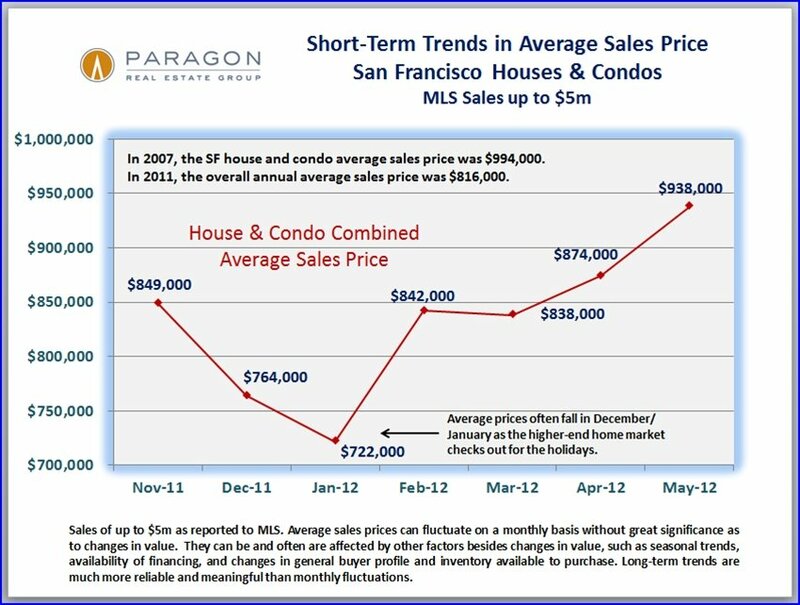 lower residence); $858/sq.ft., stunning views, 3 terraces, 3 pkg. 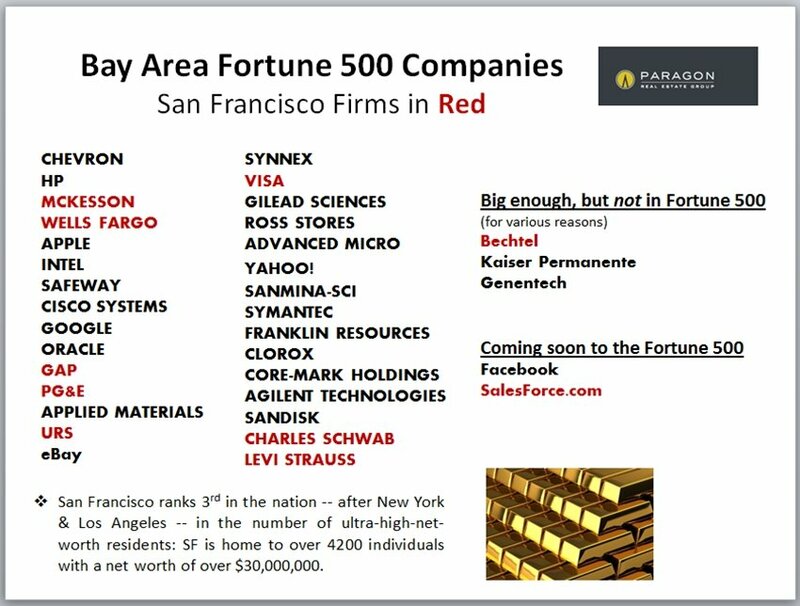 Original list price of $7,000,000; 258 days on market. $3,800,000. 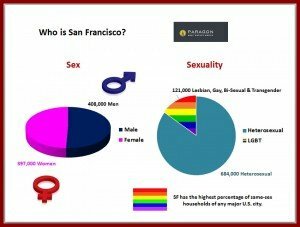 Yerba Buena on Minna: 3 BR, 3.5 BA, St. Regis condo; 2573 sq.ft., $1477/sq.ft., spectacular views, doorman building, valet pkg, leased pkg, $2569/month HOA dues. 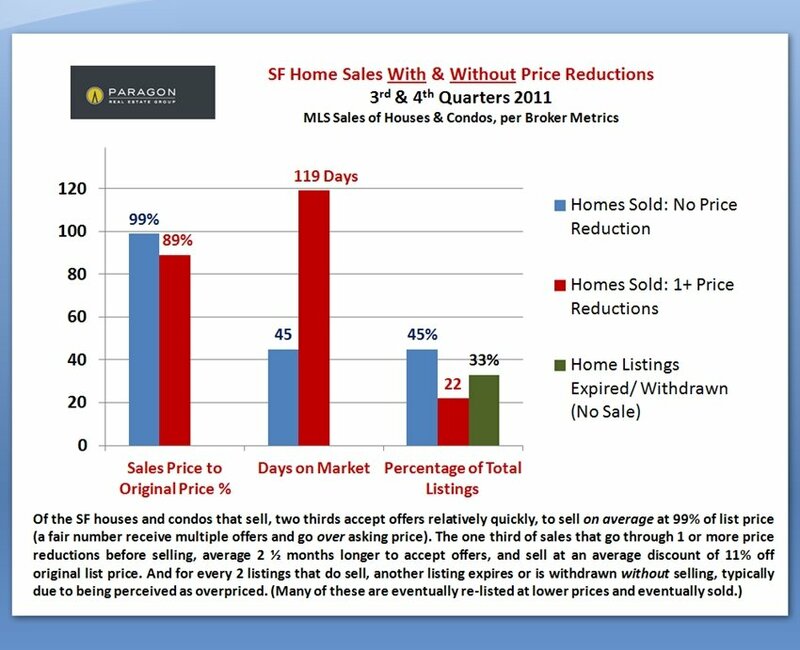 4% below asking price; 101 days on market. $3,400,000. 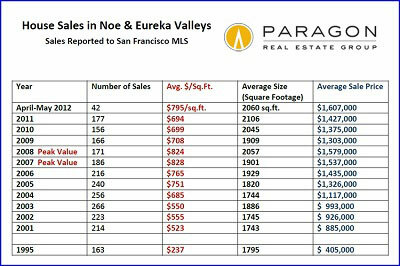 Noe Valley on Fair Oaks: 1908, 5 BR, 4.5 BA Edwardian; 4126 sq.ft., $824/sq.ft., decks, garden, double lot, 2 car pkg. 100% of asking price; 8 days on market. $3,200,000. St. Francis Wood on Santa Clara: 1929, 4 BR, 5.5 BA, Spanish-Mediterranean house; 5707 sq.ft., $562/sq.ft., double lot, heated pool, 2 pkg. 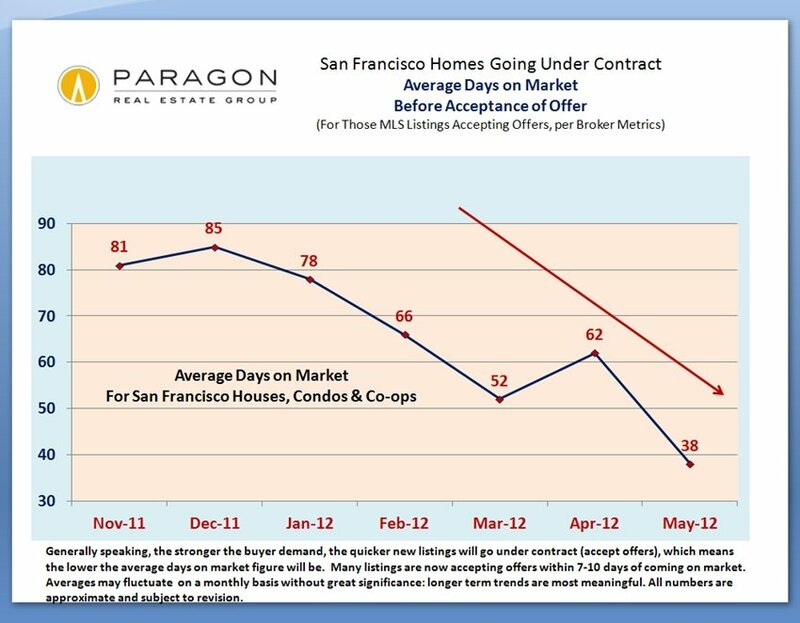 8% below original price; 73 days on market. 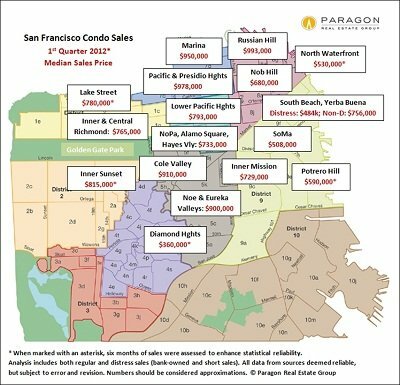 $2,995,000. Dolores Heights on Cumberland cul de sac: 1916, 3 BR, 2.5 BA, Arts & Crafts Edwardian house; 2500 sq.ft., $1198/sq.ft., “breathtaking city and bay views”, 1 pkg. 100% of asking price; 10 days on market. $2,875,000: Cole Valley on Cole: 1905, 12-room, 4 BR, 3.5 BA Edwardian home; 2850 sq.ft., $1009/sq.ft., 2 pkg. 1% over asking price; 25 days on market. $2,850,000: Marina on Magnolia: year 2000, 5 BR, 4.5 BA, contemporary house; 3400 sq.ft., $838/sq.ft., water views, studio, roof deck, 2 pkg. 5% below original price. $2,725,000. 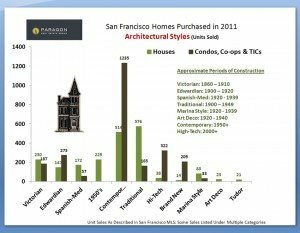 Lake Street on 25th Avenue: 1909, Thomas Churchill 4 BR, 3.5 BA Edwardian; 3700 sq.ft., $736/sq.ft., overlooking GG Bridge & Marin Headlands, plans for garage. 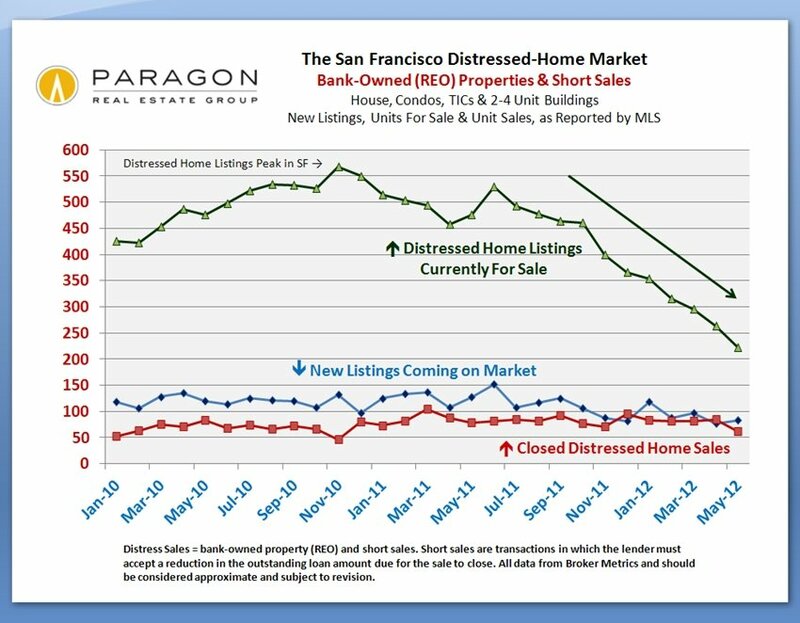 2% below asking price; 39 days on market. 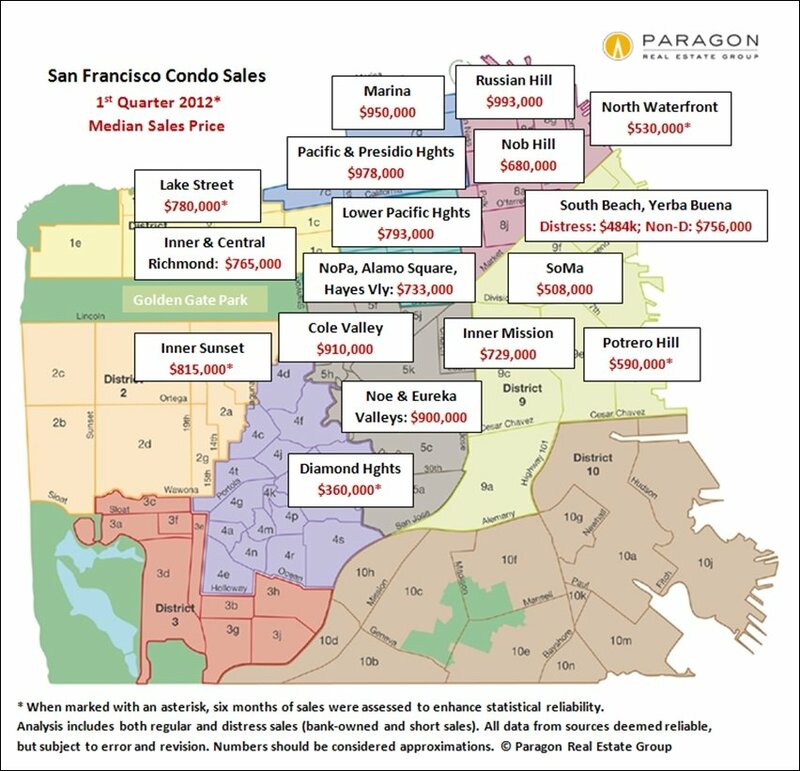 $2,250,000. South Beach: 2 BR, 2 BA, corner penthouse at The Infinity; 42nd floor, panoramic views, doorman building, private deck, 1 pkg. 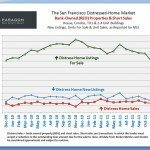 10% below asking price; 13 days on market. $1,865,000. Potrero Hill on 18th: 3 BR, 2.5 BA, renovated Victorian house; 2600 sq.ft., $717/sq.ft., bay and city views, 1 pkg. $1,749,000. West Portal on 15th: 2009, 4 BR, 3.5 BA house; 3321 sq.ft., $527/sq.ft., high Greenpoint rating, 2 car pkg w/charging station. 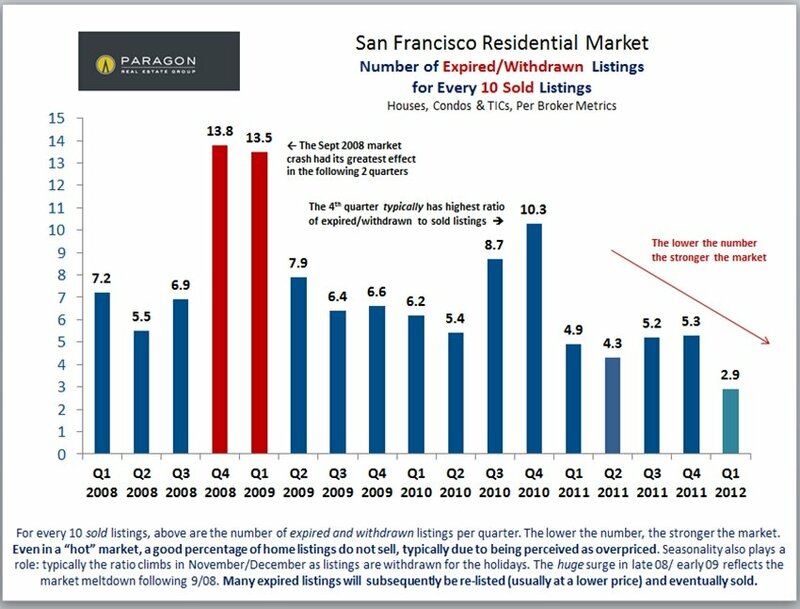 100% of asking; 6 days on market. $1,739,000. 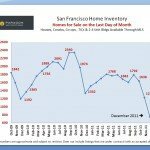 Noe Valley on Day: 1909, 8-room, 3 BR, 2.5 BA Victorian home; 2218 sq.ft. $784/sq.ft., 2 car parking. $1,693,000. Laurel Heights on Spruce: 5 BR, 3.5 BA, Historic Registry Victorian; 2662 sq.ft., $636/sq.ft., 2 pkg. Off-market sale. $1,649,000. Jackson Square: 2006, 3 BR, 2.5 BA full-floor condo; 2040 sq.ft., $808/sq.ft., private terrace, 1 pkg, city views, $898/month HOA dues. 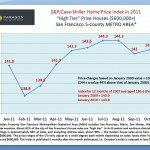 4% below asking price; 159 days on market. $1,630,000. 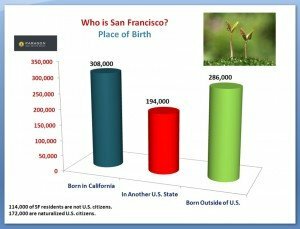 Golden Gate Heights on Ortega: 1974, 4 BR, 3.5 BA, contemporary house; 2900 sq.ft., $562/sq.ft., ocean-city-bridge views, 2 pkg. 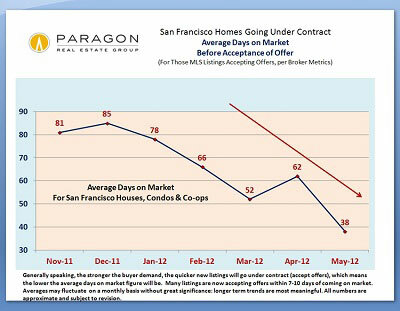 4% below asking price; 147 days on market. $1,625,000. 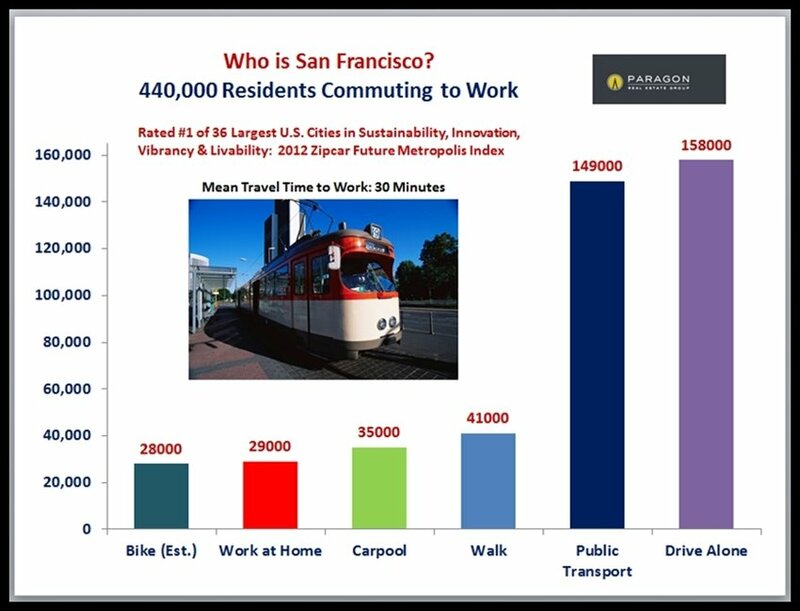 Russian Hill on Larkin: 1914, 5-room, 2 BR, 2.5 BA condo in 13 unit building; 1273 sq.ft., $1277/sq.ft., panoramic GG Bridge views, 1 pkg, $394/month HOA dues. $1,600,000. 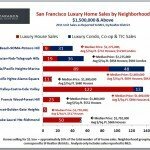 Inner Richmond on 10th: 3-level, 11-room, 4 BR, 3.5 BA house; 2577 sq.ft., $621/sq.ft., “massive contemporary remodel”, 1 pkg. 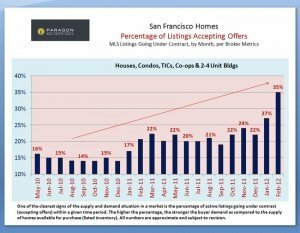 7% above asking price. $1,600,000. NoPa on Shrader: 4 BR, 3.5 BA, top-floor Edwardian condo; 3169 sq.ft., $505/sq.ft., roof garden, 2 pkg. 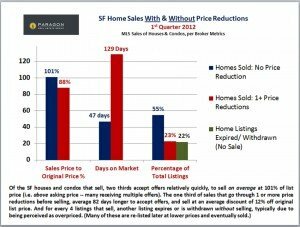 100% of asking price; 24 days on market. $1,595,000. 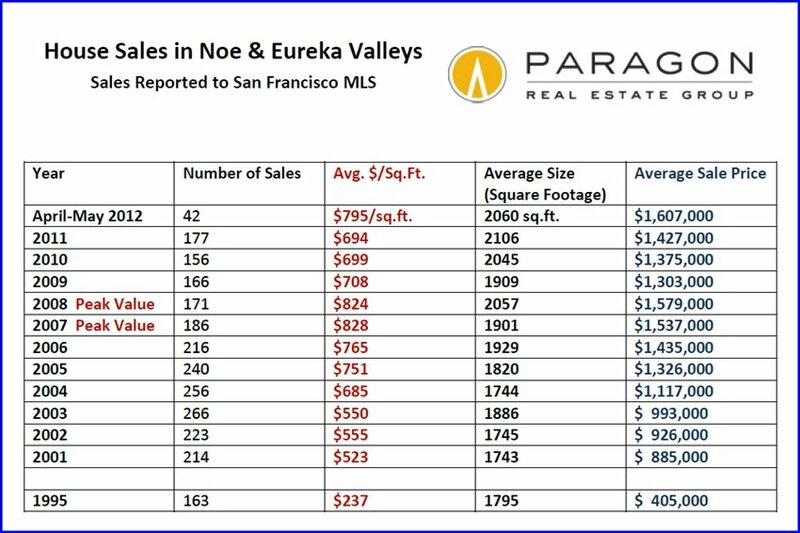 Eureka Valley on Grandview: 1946, 3-story, 3 BR, 2.5 BA house; 2315 sq.ft., $689/sq.ft., bay and downtown views, 2 pkg. 11% above asking price; 17 days on market. $1,565,000. 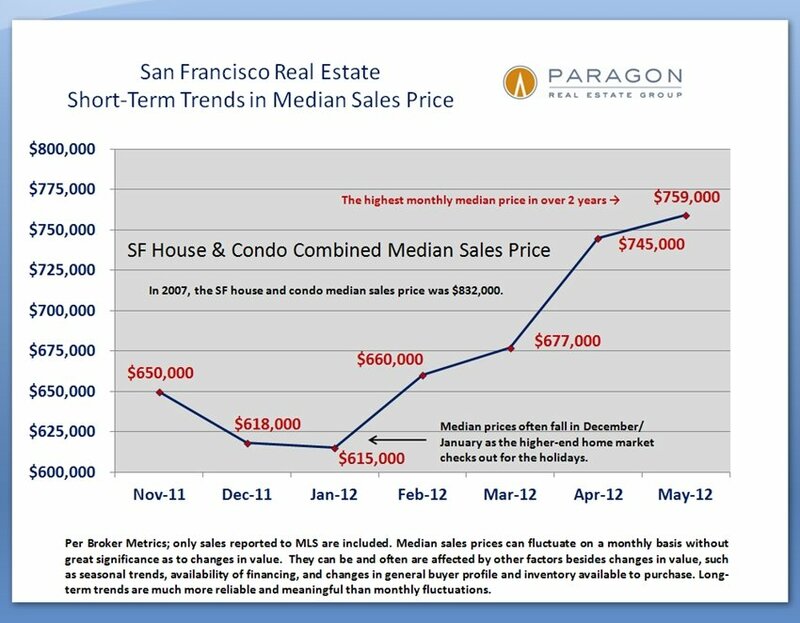 Inner Mission on Hampshire: 2001, 2-story, 3 BR, 3BA, townhouse condo; 2870 sq.ft., $545/sq.ft., fantastic views, 2 terraces. 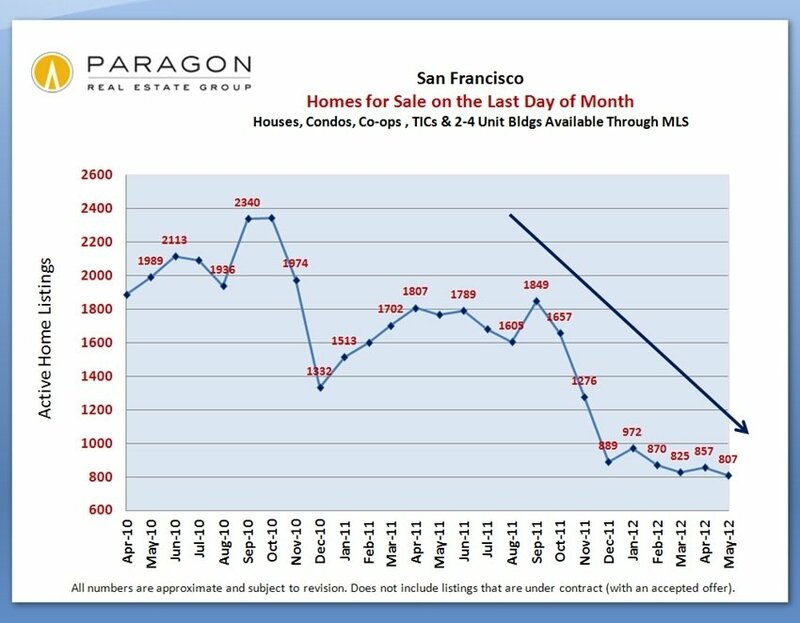 13% below original price; 65 days on market. $1,529,000. Ashbury Heights on Clifford Terrace: 3 BR, 2.5 BA house; 2135 sq.ft., $716/sq.ft., deck, fish pond, 2 car pkg. $1,500,000. Glen Park on Surrey: 2007, 3-level, 3 BR, 3 BA, contemporary house; 2521 sq.ft., $595/sq.ft., view deck, 1 pkg. 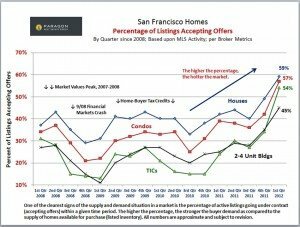 100% of asking; 40 days on market. $1,496,000. 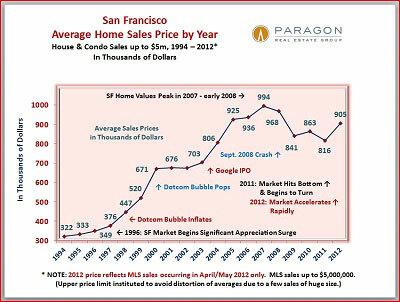 Corona Heights on Saturn: 1957, 4 BR, 3 BA, contemporary house; 1900 sq.ft., $787/sq.ft., city lights view, view deck, 2 pkg. $1,465,000. Forest Hill on Taraval: detached, 4 BR, 2.5 BA, traditional house; 2426 sq.ft., $604/sq.ft., 1 pkg. 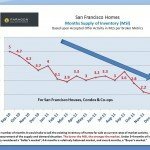 Closed at 6% above asking price. $1,450,000. Nob Hill on Jones: 1929, 7-room, 2 BR, 2 BA condo in Clay-Jones; 18th floor, panoramic bay and city views, 1475 sq.ft., $983/sq.ft., 1 pkg, $1142/month HOA dues. 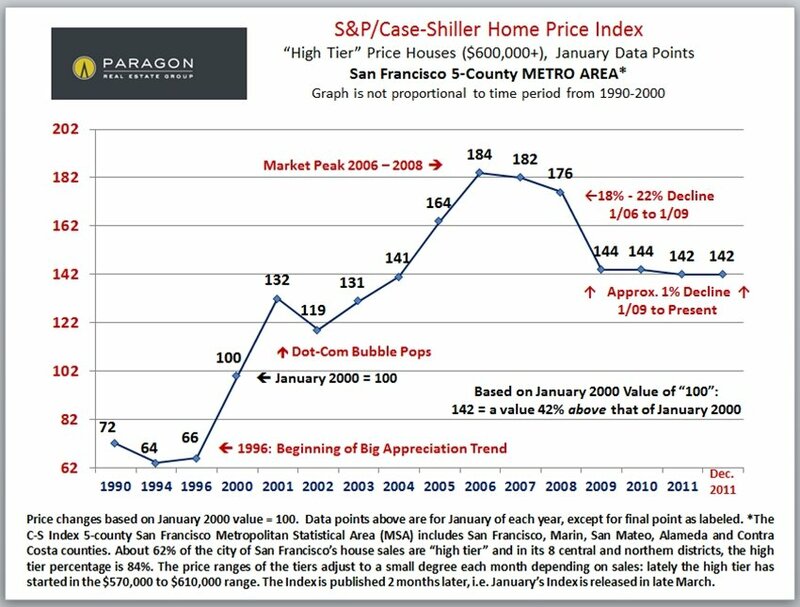 100% of asking price; 16 days on market. $1,365,000. 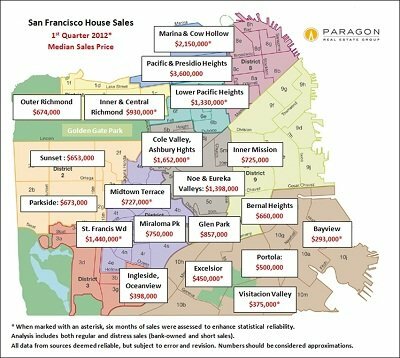 Presidio Heights on Sacramento: 1912, 6-room, lower-level, 3 BR, 1.5 BA, Arts & Crafts condo; 1617 sq.ft., $844/sq.ft., deeded garden, 1+ pkg. 2% below asking price; 55 days on market. $1,348,000. 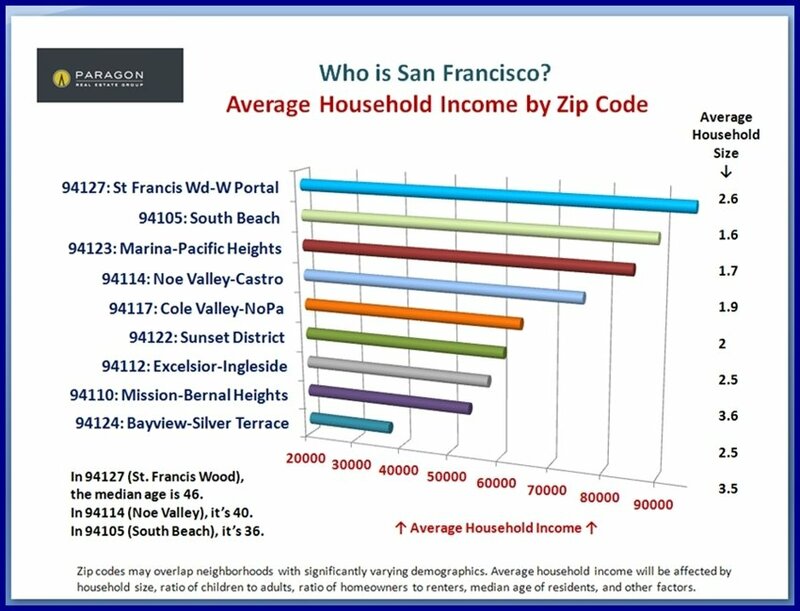 Eureka Valley on Hancock: 1924, 3 BR, 2 BA, Marina-style house; 2000 sq.ft., $674/sq.ft., 2 pkg. 3% below asking price; 15 days on market. $1,340,000. 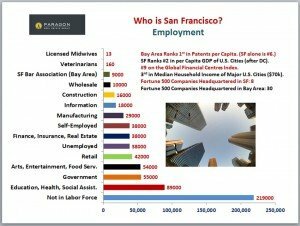 Financial District on Market: 2 BR, 2 BA condo in Ritz Carlton; 23rd floor, 1660 sq.ft., $807/sq.ft., Union Square & bay views, 1 pkg, $2621/month HOA dues. 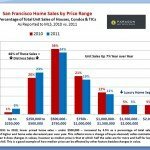 1% below asking price. $1,310,000. Inner Sunset on 8th: 1922, 4 BR, 2.5 BA, Edwardian house; 2790 sq.ft., $470/sq.ft., 1 pkg. 2% over asking price; 17 days on market. $1,300,000. Anza Vista on Fortuna: 1948, 7-room, 2 BR, 2 BA house; 2337 sq.ft., $556/sq.ft., downtown views, deck, 2 pkg. 4% over asking price; 19 days on market. 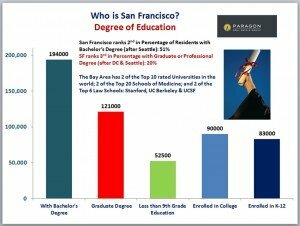 $1,262,000. Potrero Hill on Carolina: 2002, North-slope, 3 BR, 3 BA contemporary home; 1872 sq.ft., $674/sq.ft., stunning downtown views, 1 pkg. $1,125,000. Central Richmond on 30th: 1927, 8-room, 4 BR, 2.5 BA, Marina-style house; 2500 sq.ft., $446/sq.ft., 2 pkg. 6% below original price; 55 days on market. $1,120,000. 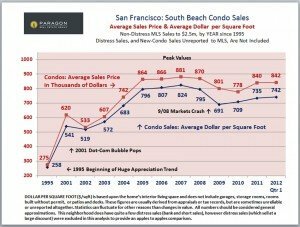 South Beach at The Towers: year 2000, 2 BR, 2 BA condo; 1167 sq.ft., $960/sq.ft., bay and marina views, huge view terrace, $814/month HOA dues. 2% over asking price; 40 days on market. $1,040,000. 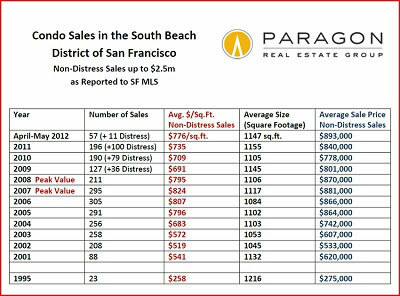 St. Francis Wood on Yerba Buena: 1924, 3 BR, 1.5 BA house; 1612 sq.ft., $645/sq.ft., 1 pkg. 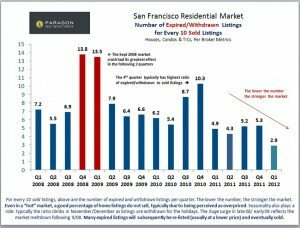 5% below asking price; 118 days on market. $1,030,000. Haight Ashbury on Masonic: top floor, 5-room, 2 BR, 2 BA, Victorian condo; “historically significant”, 1596 sq.ft., $645/sq.ft., 1 pkg. 8% over asking price; 5 days on market. 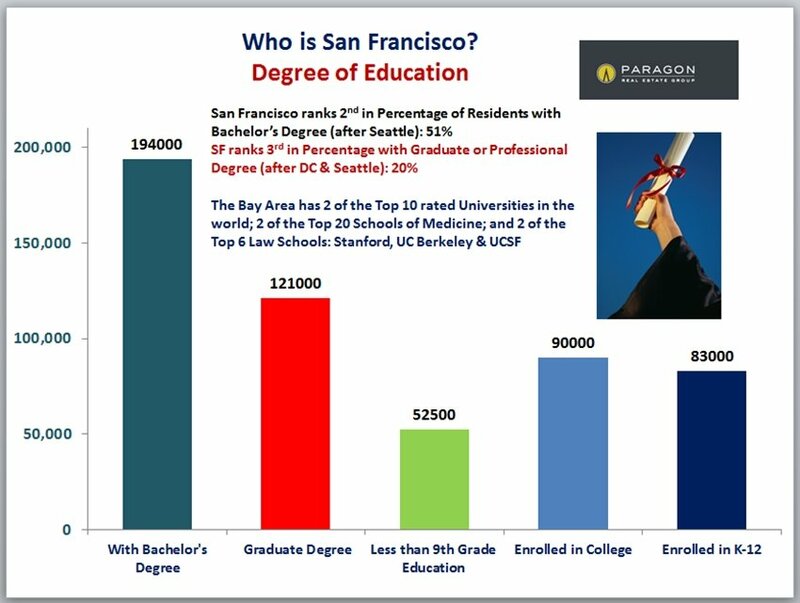 $1,020,000. Midtown Terrace on Midcrest: 1996, 6-room, 3 BR, 3.5 BA house; 1908 sq.ft., $535/sq.ft., 180 degree bay and ocean views, 2 decks, 1 pkg. 2% over asking price; 34 days on market. 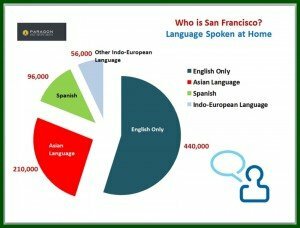 $1,006,000. Lone Mountain on Anza: 3 BR, 2 BA, detached, Spanish-Med house; 2028 sq.ft., $523/sq.ft., trust sale, 1 pkg. 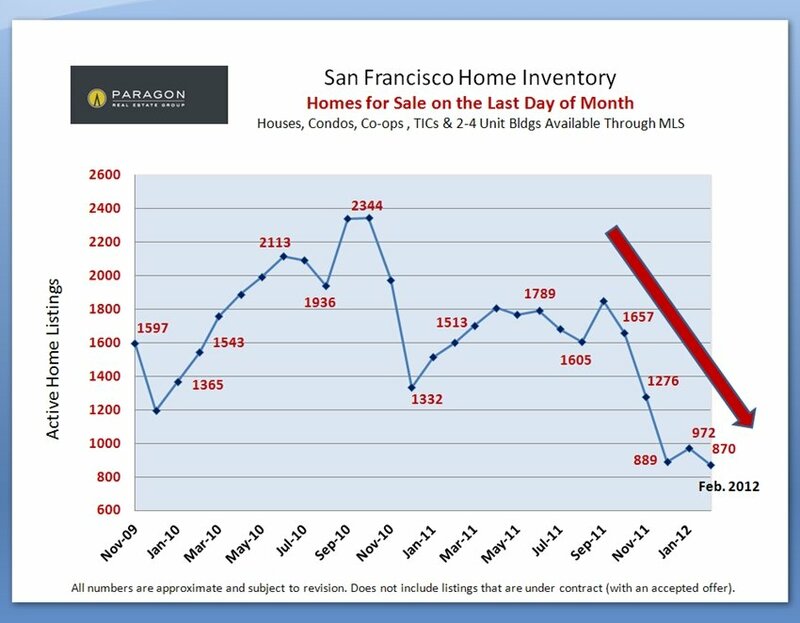 12% below original list price; 206 days on market. $1,000,000. 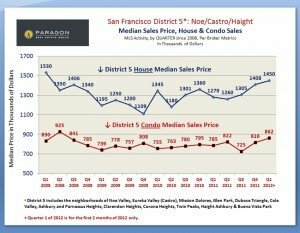 Noe Valley on Day: 3 BR, 2 BA, 6-room, Victorian house; 1286 sq.ft. with expansion potential, $778/sq.ft., 2 pkg. 26% over asking price; 28 days on market. $1,000,000. Marina on Beach: top floor, 1929, 5-room, 2 BR, 2 BA, Spanish-Med condo; 1515 sq.ft., $660/sq.ft., 1 pkg, $650/month HOA dues. $985,000. Cow Hollow on Greenwich: 3 BR, 2 BA, TIC townhouse; 1650 sq.ft., $597/sq.ft., 1 pkg, $465/month HOA dues. 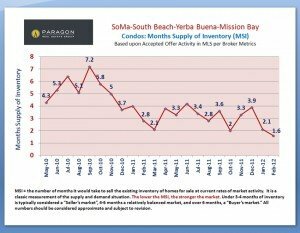 100% of asking; 45 days on market. $940,000. Duboce Triangle on Henry: 1982, top-floor, 2 BR, 2 BA condo; 1391 sq.ft., $676/sq.ft., south deck, 1 pkg, $390/month HOA dues. 18% over asking price; 30 days on market. $905,000. Hayes Valley on Buchanan: top-floor, 3 BR, 1 BA, Edwardian condo; 1578 sq.ft., $574/sq.ft., deck, 1 pkg. 3% over asking price; 41 days on market. $873,000. Pacific Heights on Clay: 1962, top-floor, 3 BR, 2 BA condo in 12 unit bldg; 1300 sq.ft., $672/sq.ft., shared laundry, 1 pkg. 9% over asking price; 15 days on market. $850,000. Bernal Heights on Coleridge: 1947, 3 BR, 2 BA house; 1358 sq.ft., $626/sq.ft., view deck, 1 pkg. 11% over asking price; 27 days on market. $845,000. 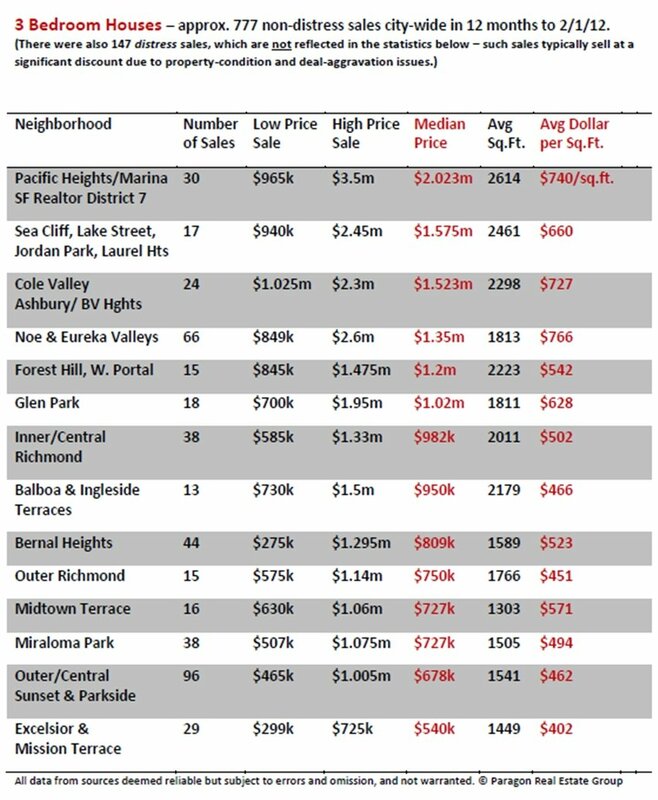 Miraloma Park on Rockdale: 3 BR, 3 BA, Spanish-Med house; 1770 sq.ft., $477/sq.ft., trust sale, 2 decks, $39,000 pest report, 2 pkg. 11% below asking price; 99 days on market. $845,000. Diamond Heights on Gold Mine: 1966, 6-room, 3 BR, 2.5 BA house; 1964 sq.ft., $430/sq.ft., sweeping views, tenant occupied, 2 pkg. 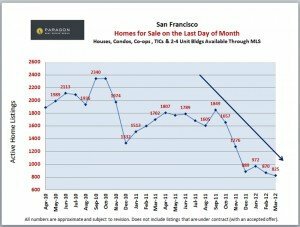 108 days on market. $844,000. Mission Dolores on 17th: 1993, 6-room, 1st floor, 3 BR, 2 BA, contemporary condo; 1242 sq.ft., $680/sq.ft., 1 pkg, $300/month HOA dues. 6% over asking price; 42 days on market. $820,000. Lake Street on 25th: 1930, 5-room, 2 BR, 2 BA condo; 1300 sq.ft., $631/sq.ft., panoramic views, 1 pkg, $460/month HOA dues. $806,000. Lake Shore on Berkshire: 1953, 6-room, split-level, 3 BR, 2 BA house; 1686 sq.ft., $478/sq.ft., trust sale, 2 pkg. 3% over asking price; 33 days on market. $799,000. Central Sunset on 35th: 1932, 2 BR, 2 BA, Spanish-Med Rousseau house; 1740 sq.ft., $459/sq.ft., tenant occupied, 2 pkg. 100% of asking price. $785,000. 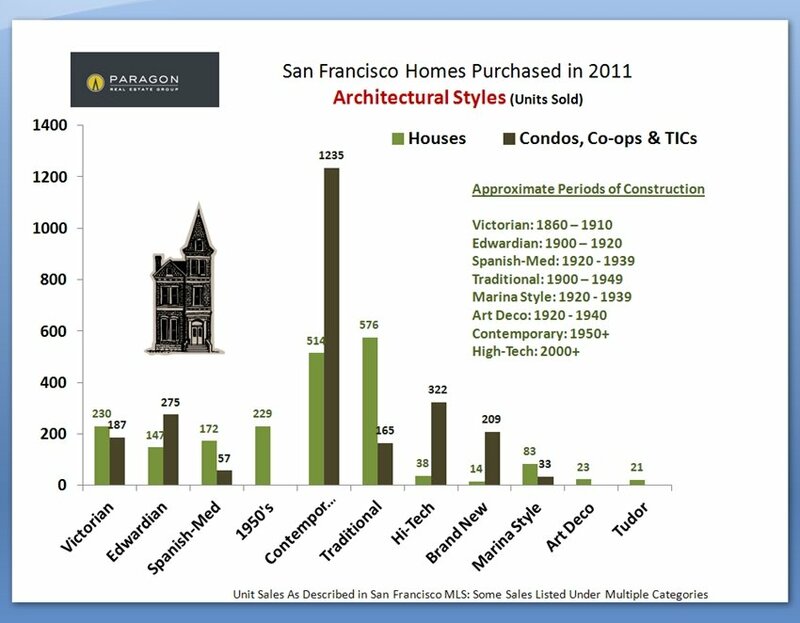 SoMa on Natoma: 1906, top-floor, 3 BR, 2 BA, Victorian condo; 1525 sq.ft., $515/sq.ft., 2 pkg, $200/month HOA dues. 1% over asking price; 35 days on market. $780,000. South Beach on Beale: 2 BR, 2 BA condo at the BridgeView; bank sale, 1074 sq.ft., $726/sq.ft., outstanding views, 24-hour doorman, 1 pkg. 4% over asking price; 12 days on market. $775,000. Noe Valley on Douglass: 1910, 2 BR, 1 BA, Victorian house; 1050 sq.ft., $738/sq.ft., expansion potential, deck, 2 pkg. 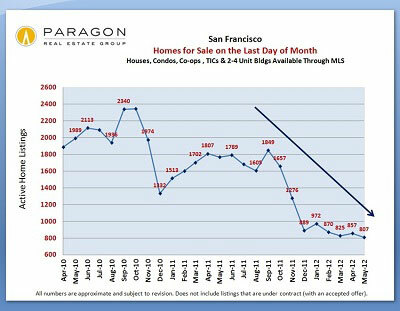 11% below original asking price; 171 days on market. $765,000. North Beach on Francisco: 2001, 2-level, 2 BR, 2 BA, loft-style condo in the Malt House; 1033 sq.ft., $741/sq.ft., 1 pkg, $590/month HOA dues. 2% over asking price; 36 days on market. $757,000. Parkside on 22nd: 1939, tunnel-entrance, 7-room, 3 BR, 2 BA house; 1509 sq.ft., $502/sq.ft., 1 pkg. 8% over asking price; 27 days on market. $755,000. Outer Richmond on 37th: 1924, 6-room, 2 BR, 2 BA house; 1750 sq.ft., $431/sq.ft., 2 pkg. 2% over asking; 29 days on market. $700,000. Outer Richmond on 38th: 1925, 2 BR, 1 BA house; in-law apartment, 1450 sq.ft., $483/sq.ft., 1 pkg. $660,000. 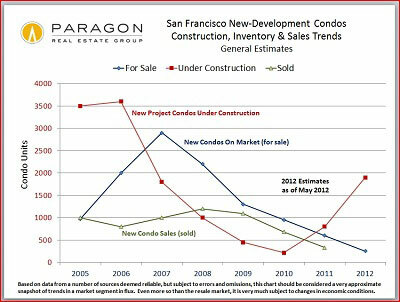 Potrero Hill on Kansas: 2007, 4-room, 2 BR, 2 BA condo in 138 unit complex; 1077 sq.ft., $613/sq.ft., 1 pkg. 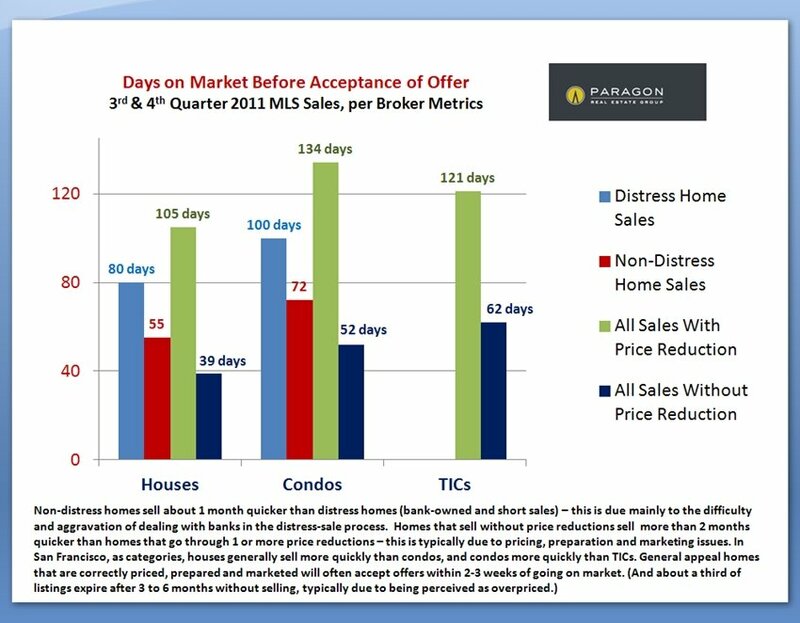 2% below asking price; 121 days on market. $643,500. Inner Sunset on 17th: 1926, 6-room, 2 BR, 1 BA, Marina-style condo; 1550 sq.ft., $415/sq.ft., 1 pkg, $358/month HOA dues. $620,000. Bernal Heights on Peralta: 1940, 6-room, 3 BR, 2 BA house; bonus room and bath, 1200 sq.ft., $517/sq.ft., 1 pkg. $610,000. 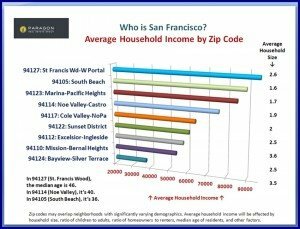 Pacific Heights on Scott: top-floor, 4-room, 1 BR, 1 BA, Edwardian condo; 748 sq.ft., $816/sq.ft., no pkg, $250/month HOA dues. 11% over asking price; 21 days on market. $610,000. 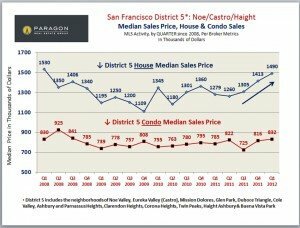 Merced Heights on Garfield: 2 BR, 1 BA house; in-law apartment, 1287 sq.ft., $474/sq.ft., ocean view, 1 pkg. $605,000. Nob Hill on Broadway: 1982, 5-room, 2 BR, 2 BA condo; bank sale, 1097 sq.ft., $552/sq.ft., patio, 1 pkg, $631/month HOA dues. 5% over asking price. $600,000. Sunnyside on Mangels: 1961, 8-room, 4 BR, 3 BA house; short sale, 1520 sq.ft., $395/sq.ft., 2 pkg. $600,000. Outer Parkside on 48th: 1954, 6-room, 3 BR, 2 BA house; 1195 sq.ft., $502/sq.ft., ocean view, big deck, 1 pkg. 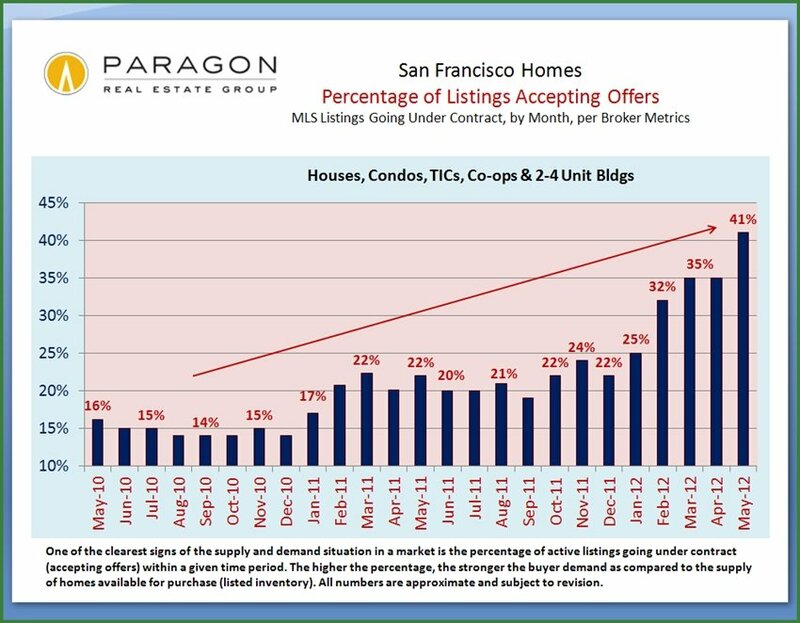 100% of asking price. $595,000. Inner Richmond on 4th: 1907, 2 BR, 1 BA condo; bank sale, bonus rooms, 1314 sq.ft., $453/sq.ft., 1 pkg. $580,000. SoMa on 8th: 1997, 1 BR, 2 BA, live-work loft/condo; probate sale, 1369 sq.ft., $424/sq.ft., 1 pkg. $588,000. Outer Sunset on 43rd: 1954, 3 BR, 1.5 BA condo; 1235 Sq.ft., $476/sq.ft., ocean view, 2 pkg. 18% over asking price; 23 days on market. $560,000. Lower Pacific Heights on Bush: 2 BR, 2 BA TIC; Smart Car included in sale, 1100 sq.ft., $509/sq.ft., $406/month HOA dues. $536,000. Buena Vista Park on BV: 1986, 3-room, 1 BR, 1 BA condo; stunning downtown views, 734 sq.ft., $730/sq.ft., 1 pkg, $578 HOA dues. $510,000. Crocker Amazon on Chicago: 1925, 5-room, 2 BR, 1 BA house; 1100 sq.ft., $464/sq.ft., large lot, 2 pkg. 3% over asking price; 30 days on market. 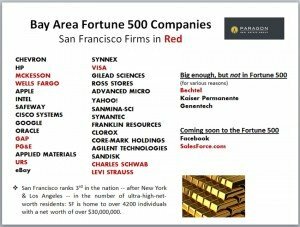 $510,000. Outer Mission on Alemany: 1940, 2 BR, 1 BA house; bonus room and bath, 1200 sq.ft., $425/sq.ft., 1 pkg. 3% over asking price; 33 days on market. $488,000. 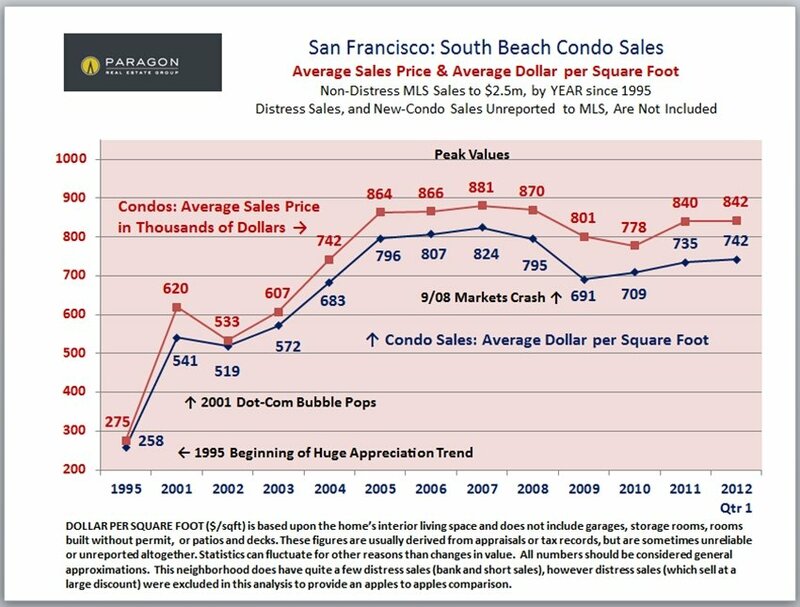 South Beach on Berry: 2007, 1 BR, 1 BA condo at Park Terrace; short sale, 803 sq.ft., $608/sq.ft., 1 pkg, $468/month HOA dues. $485,000. Excelsior on Dublin: 1944, 6-room, 2 BR, 2 BA house; trust sale, 1295 sq.ft., $375/sq.ft., 1 pkg. 22% over asking price. $460,000. Bernal Heights on Nevada: 2 BR, 2 BA house; “contractor’s special”, bonus rooms, 1164 sq.ft., $395/sq.ft., 1 pkg. $450,000. Ingleside Heights on Ramsell: 1961, 3 BR, 2 BA house; short sale, 1319 sq.ft., $341/sq.ft., 2 pkg. $410,000. Oceanview on Montana: 1955, 5-room, 2 BR, 1 BA house; trust sale, 1050 sq.ft., $390/sq.ft., full basement, 2 pkg. 3% over asking price. $380,000. 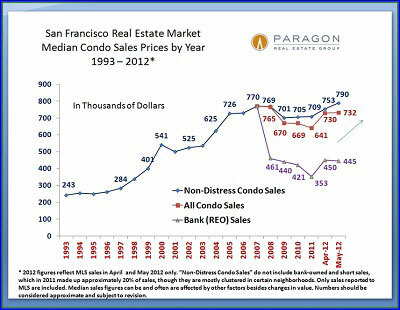 Marina on Jefferson: 1991, 2-room condo; bank sale, 558 sq.ft., $681/sq.ft., no parking, $316/month HOA dues. $380,000. Outer Richmond on La Playa: 1982, top-floor, 2 BR, 2 BA condo; 1043 sq.ft., $364/sq.ft., ocean views, 1 pkg. 9% over asking price; 29 days on market. $348,000. Diamond Heights on Red Rock: 1972, 3-room, 1 BR, 1 BA condo in 396 unit complex; 830 sq.ft., $420/sq.ft., 1 pkg, $437/month HOA dues. $329,000. Downtown on O’Farrell: 1930, 1 BR, 1 BA, Art Deco condo in The Hamilton; 945 sq.ft., $348/sq.ft., large bonus room, no parking, $723/month HOA dues. 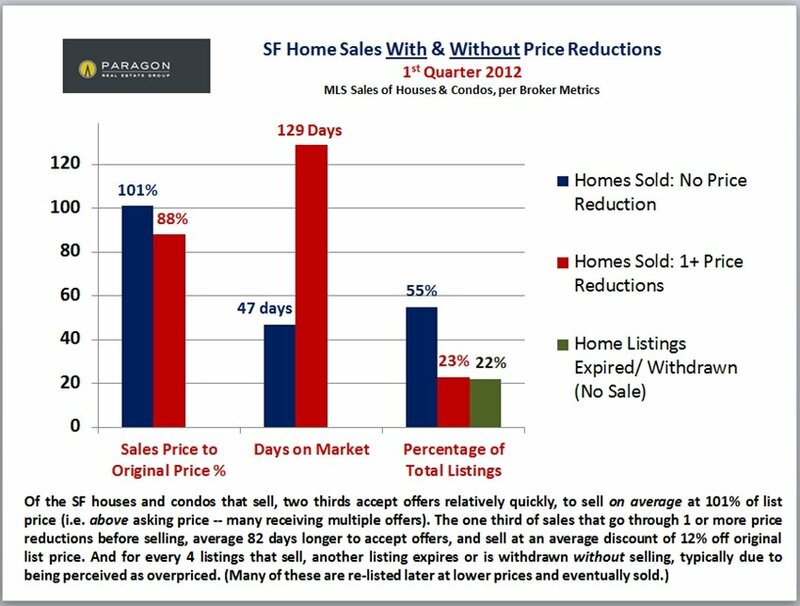 11% below original asking price; 246 days on market. $295,000. Bayview on Innes: 1927, 6-room, 2 BR, 1 BA house; bank sale, 1413 sq.ft., $209/sq.ft., 1 pkg. 16% over asking price; 24 days on market. BR = bedrooms, BA = baths, days on market = the days between going on market and being designated “pending sale, contingencies removed”. 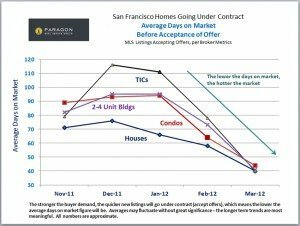 Homes that sold at or over asking price will typically have accepted offers within 7 to 14 days of going on market (commonly after receiving multiple offers), even if it may have taken additional weeks to remove contingencies of sale and be designated “pending”. 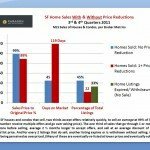 Median price is that price at which half the sales occurred for more and half for less. 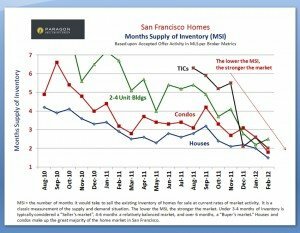 It may be and often is affected by other factors besides changes in value, such as changes in buying patterns or available inventory. 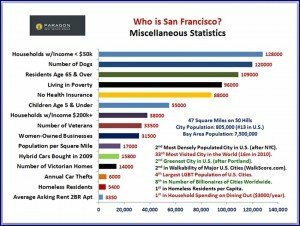 Square footage is based on “livable space”, which may be measured in different ways, but should not include decks, patios, yards, garages, unfinished basements and attics, or rooms built without permit (“bonus rooms” and “in-law apartments”). 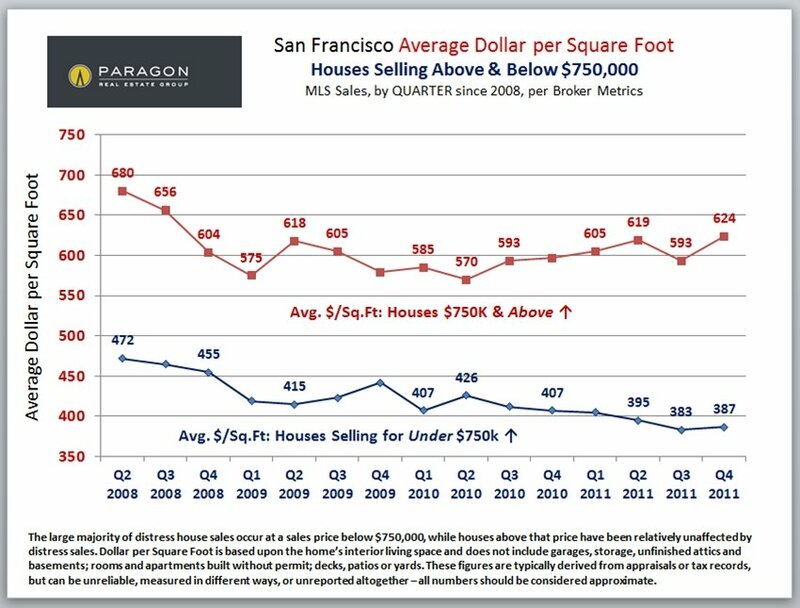 Square footage figures are often unreported or unreliable. 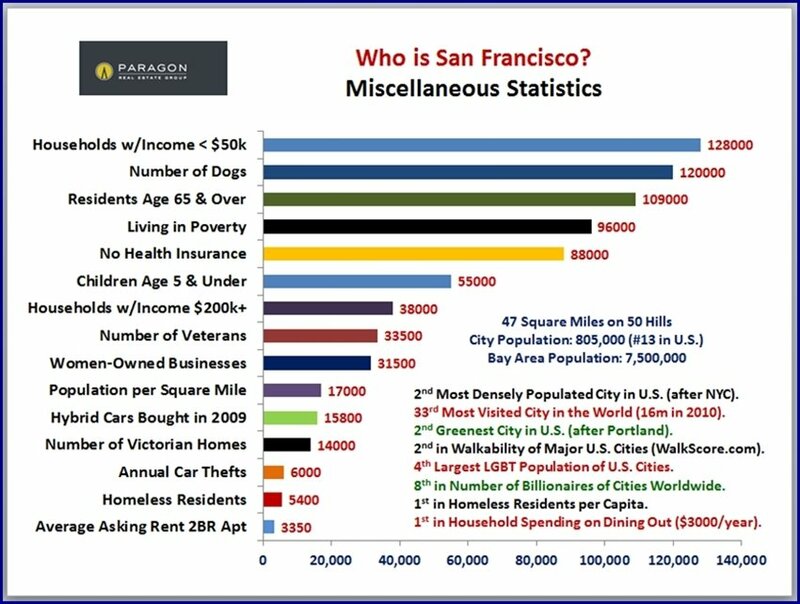 All median and average statistics should be considered approximations, and it is unknown how they apply to any specific property. 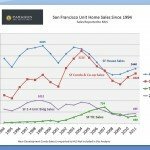 Several times in the past 30 years, the San Francisco real estate market has turned up or down very quickly and very dramatically: in the mid-eighties – up; early nineties – down; 1996 – up (and up and up, except for the dotcom hiccup); 2008 – way down; and now we believe another dramatic turn up has begun. 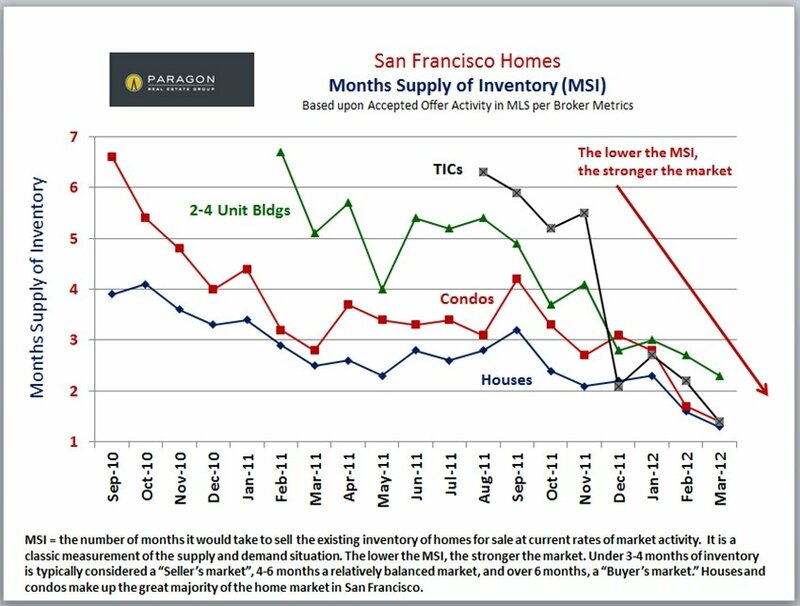 By virtually every statistical measure of supply and demand, the city’s market is experiencing major acceleration. 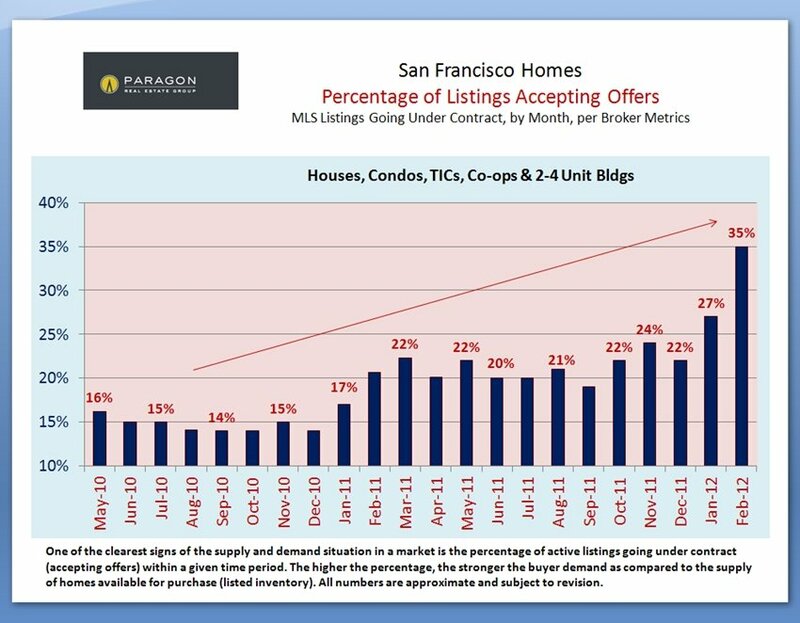 Multiple-offer, competitive-bidding situations have hit levels not seen in many years and this is putting strong upward pressure on values in many of San Francisco’s neighborhoods. 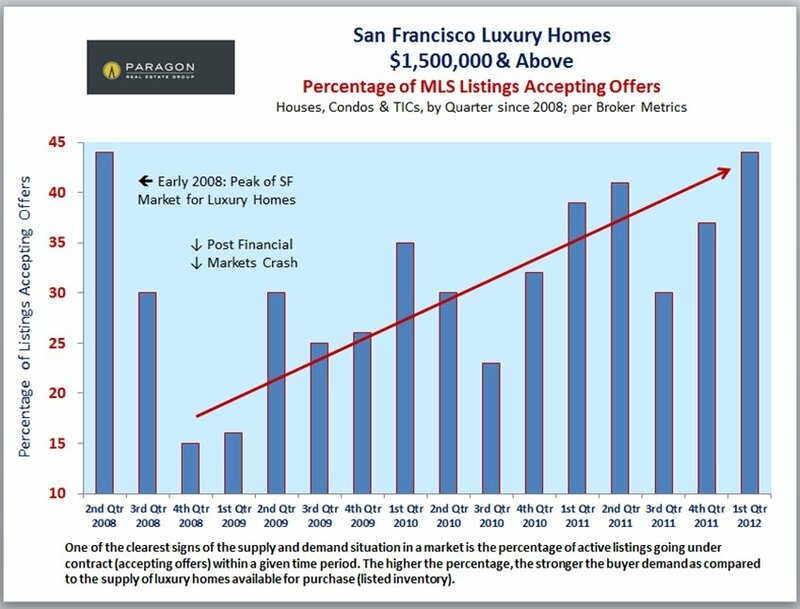 The more affluent areas of the city – never much impacted by distress sales and now highly sought after by buyers – are leading the recovery. 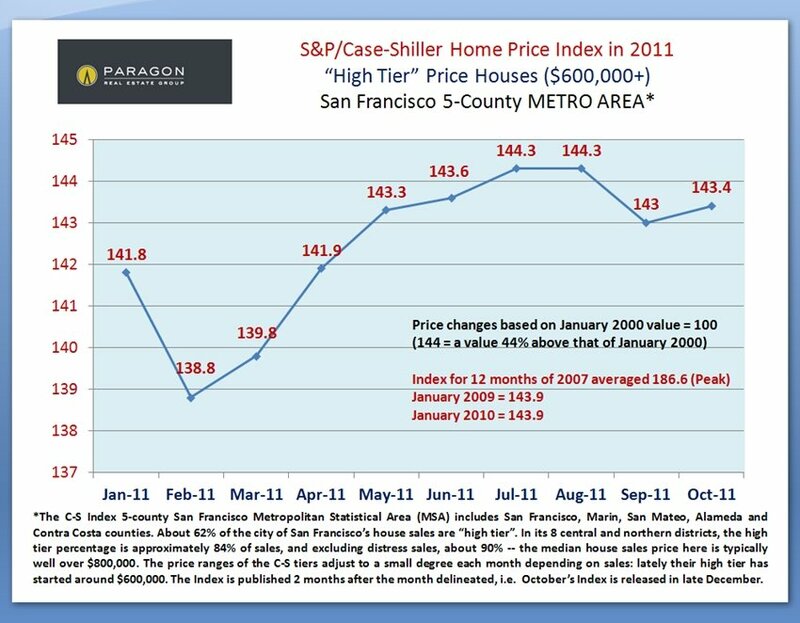 We know this runs contrary to the Case-Shiller Index, but the city, and especially its higher-end segments, make up only a very small part of the Case-Shiller 5-county SF Metro Area, and currently the Index does not reflect the city’s market conditions and trends. A new war or financial crisis might derail the upturn, but absent such an event, and considering the city’s improving economic conditions, we expect it will continue. list price. 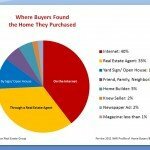 The competition between motivated buyers has heated up enormously. 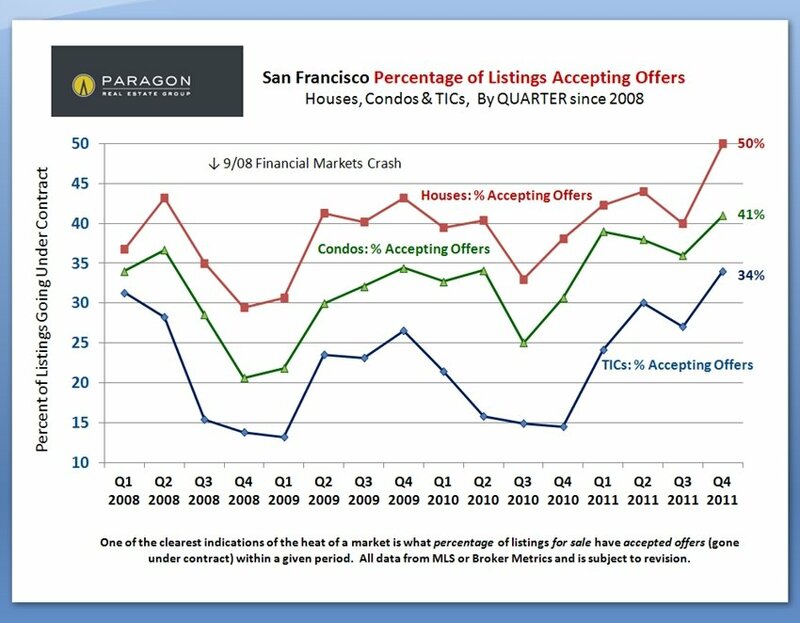 SF is now seeing the highest percentages of listings accepting offers in memory. 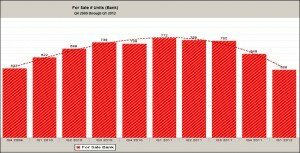 probably due to the severe shortage of new and resale condos available to purchase. 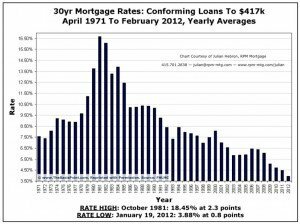 typically due to being perceived as overpriced – in many years. 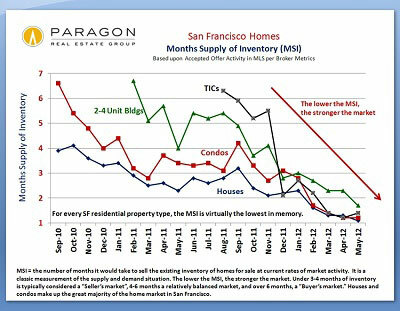 The lowest Months Supply of Inventory (MSI) readings in memory. For all property types. An incredibly low level of properties available to purchase. 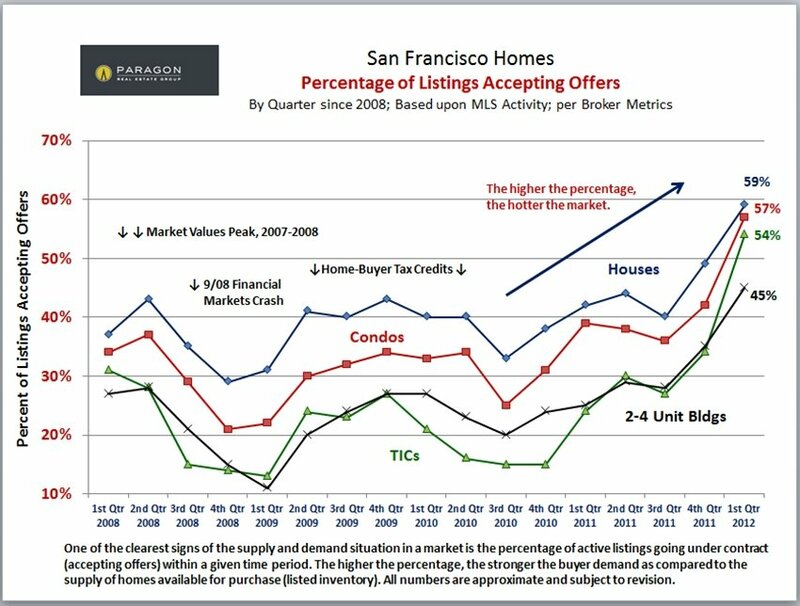 Right now, properties are actually selling more quickly than new listings are coming on market. 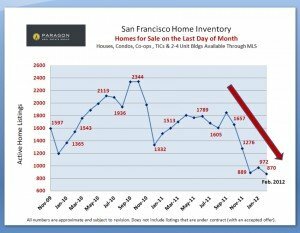 Average Days on Market have crashed for all property types. 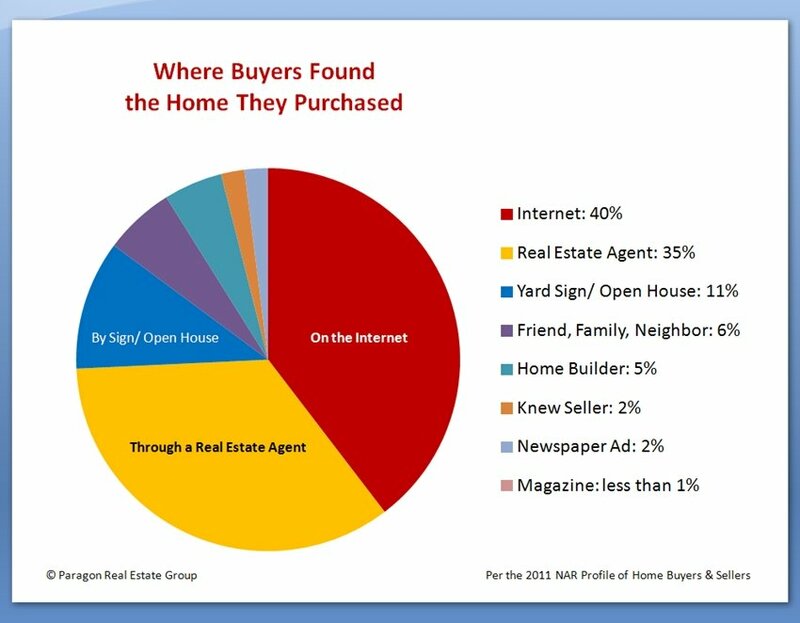 A substantial percentage of listings is selling virtually immediately upon coming on market (i.e. within 7-10 days). 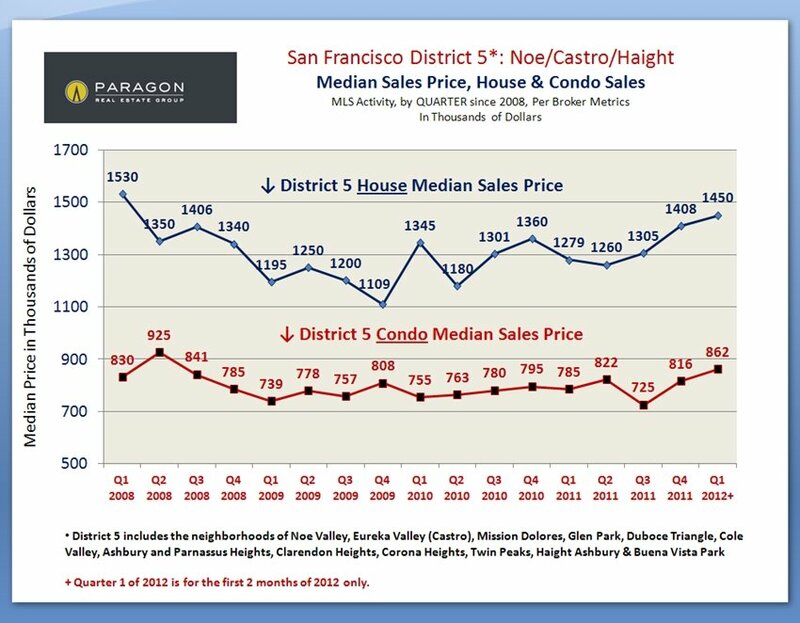 We’re starting to see upward movement in values in some San Francisco neighborhoods, especially those most popular with affluent high-tech buyers. 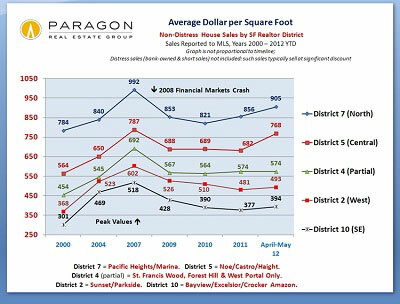 Remember that market demand may take a while to translate into changes in values, and that different city neighborhoods are recovering at different speeds. 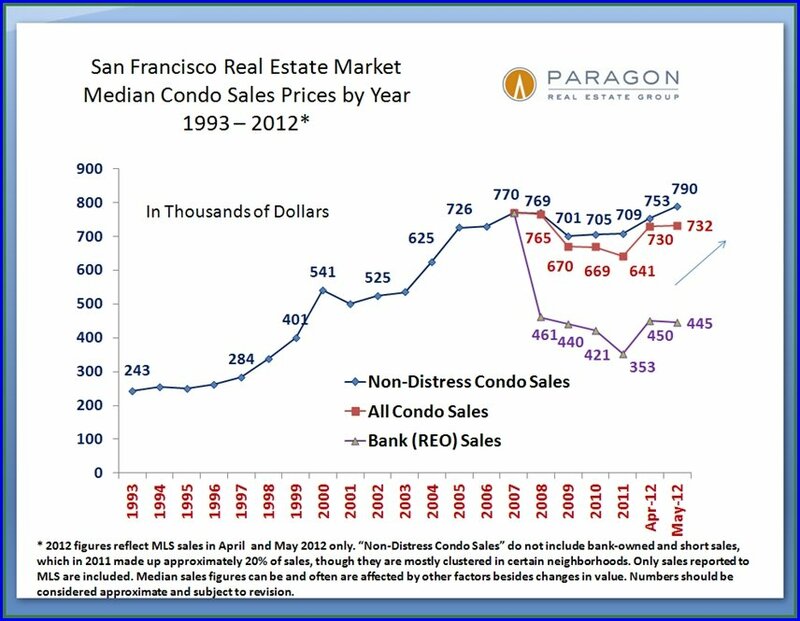 San Francisco’s market is definitely recovering much more quickly than most other areas of the Bay Area, state and country. 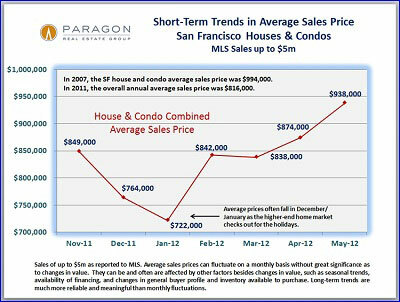 The luxury home market is also seeing significant increases in demand and upward pressure on values. 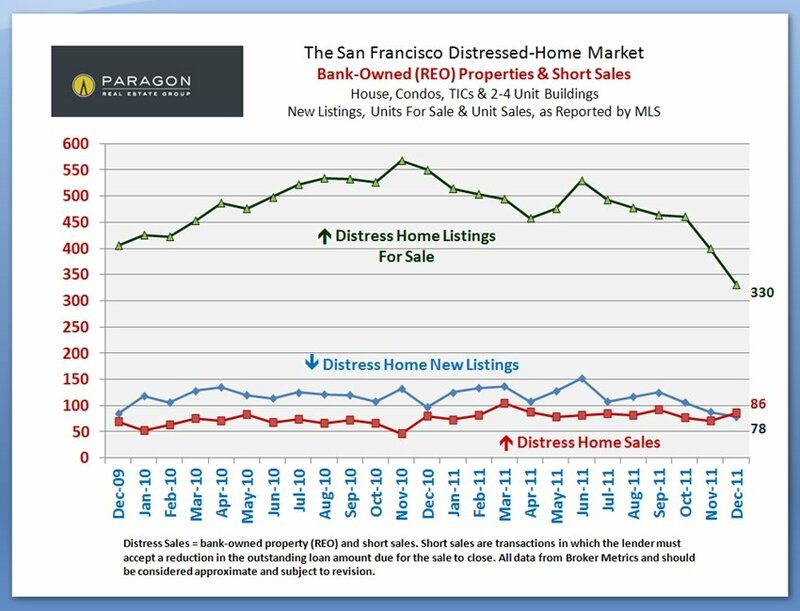 The number of distress home listings is markedly decreasing (and, in any case, they are generally clustered in the less affluent neighborhoods and in the lower price ranges). 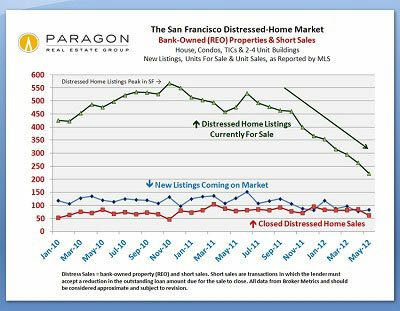 If the recovery continues, fewer and fewer homes will require transfer as distress sales. 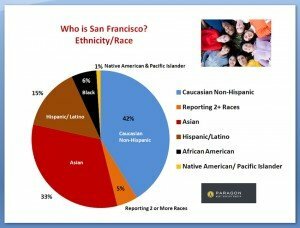 In case you missed it, here is a chart from our recent analysis of San Francisco demographics. 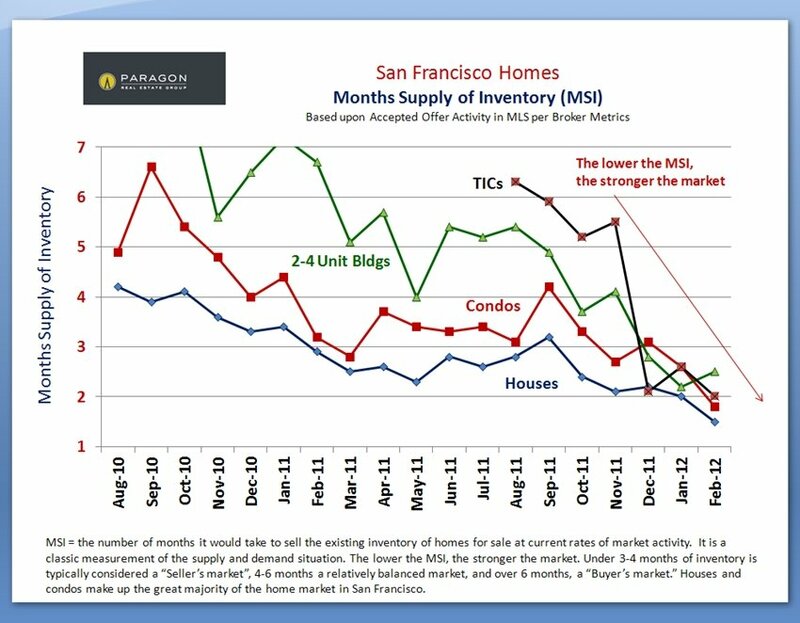 MSI is a measure of how long it would take to sell the existing inventory of homes for sale at current market conditions: the lower the MSI, the stronger the demand as compared to supply. For every property type in San Francisco, MSI is either at its lowest reading ever, or very, very close to it. 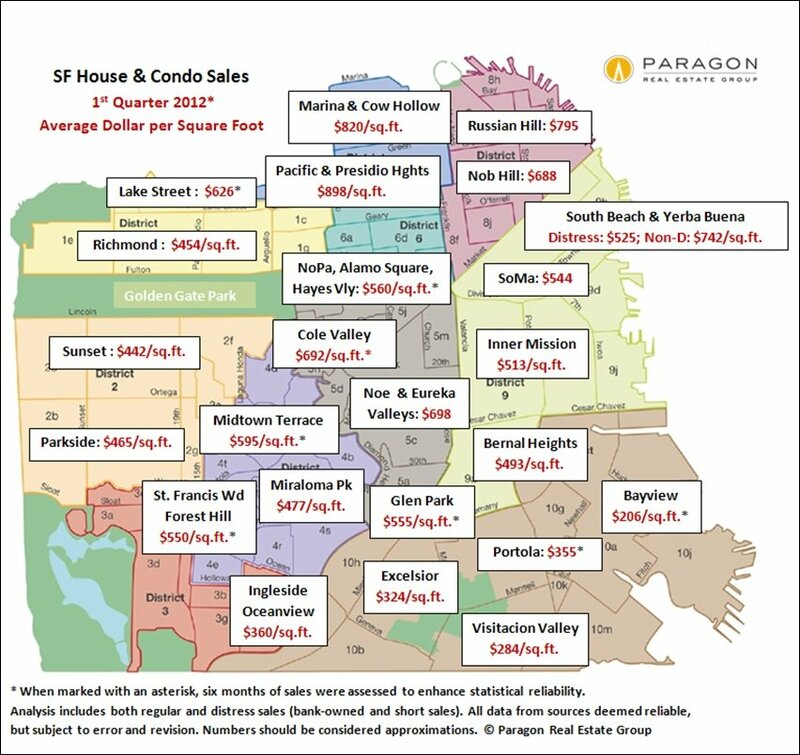 Any reading below 3-4 months of inventory is typically considered a “Sellers’ market.” All SF property types now register as strong Sellers’ markets, though conditions do vary by neighborhood. 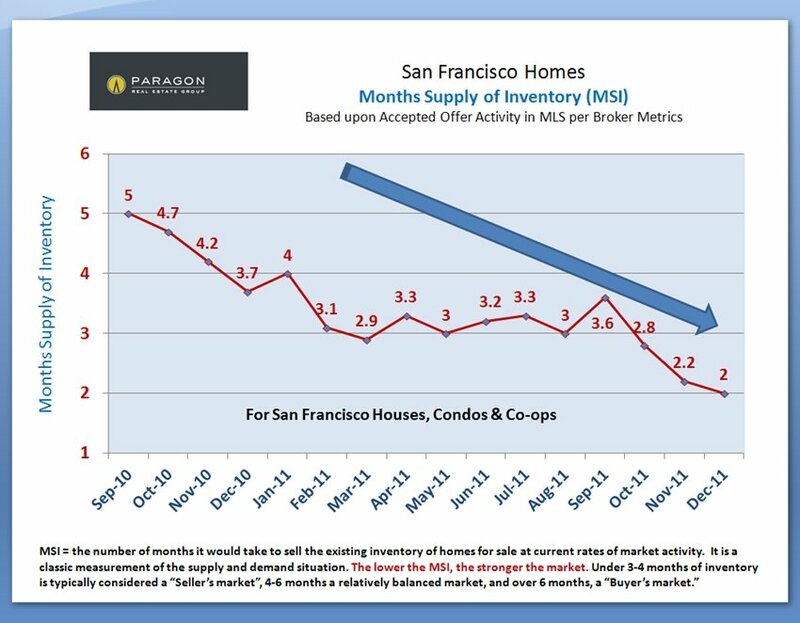 Nationally, MSI has also fallen, but it is still over 6 months of inventory. 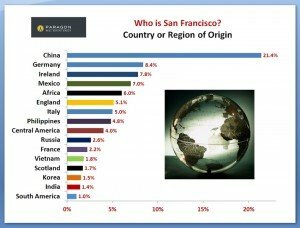 Realtor District 5, in the center of the city, is one of the areas where the market has changed most dramatically – to some extent, due to being highly sought after by high-tech employees working both inside and outside the city. 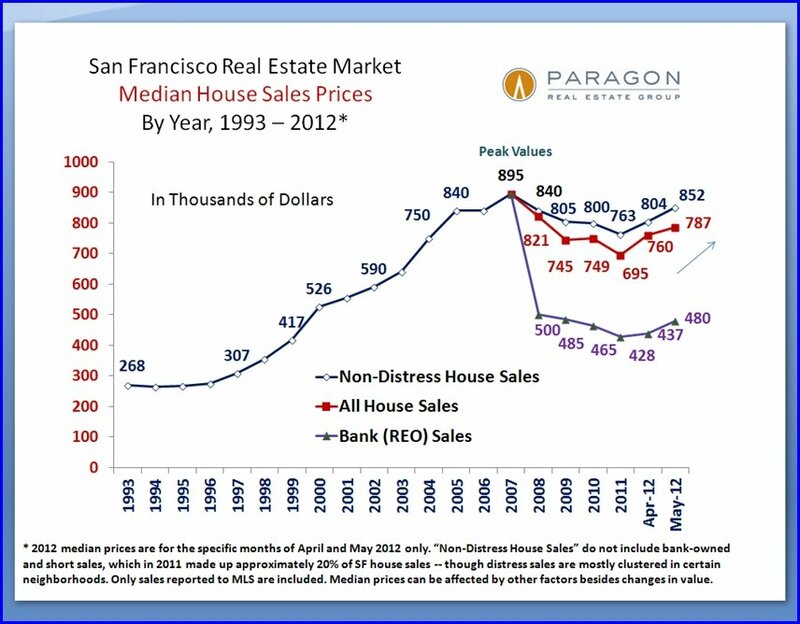 Though median sales price is an imperfect signifier of changes in values, and can fluctuate for a number of reasons, we believe in this case it generally reflects market reality. 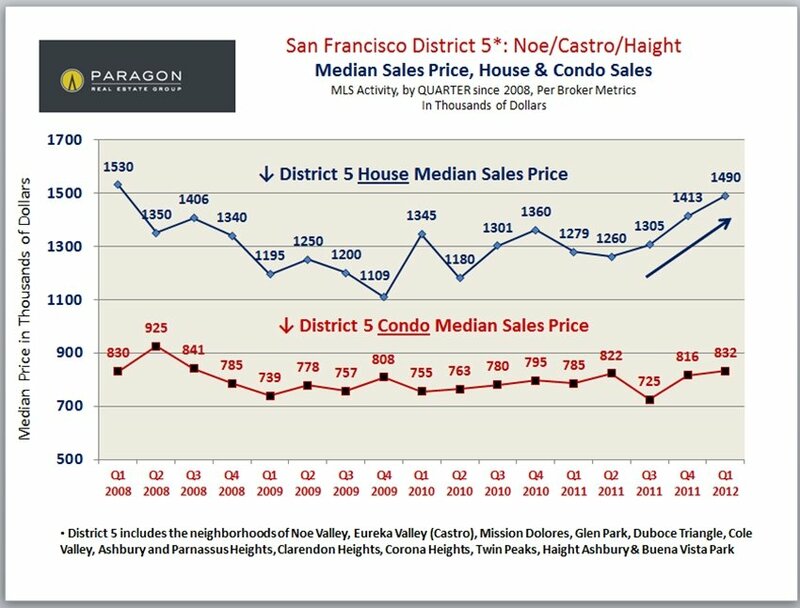 Huge buyer demand and extremely low inventory in District 5 are pushing prices higher: the median sales prices for both houses and condos have risen to their highest points since 2008. 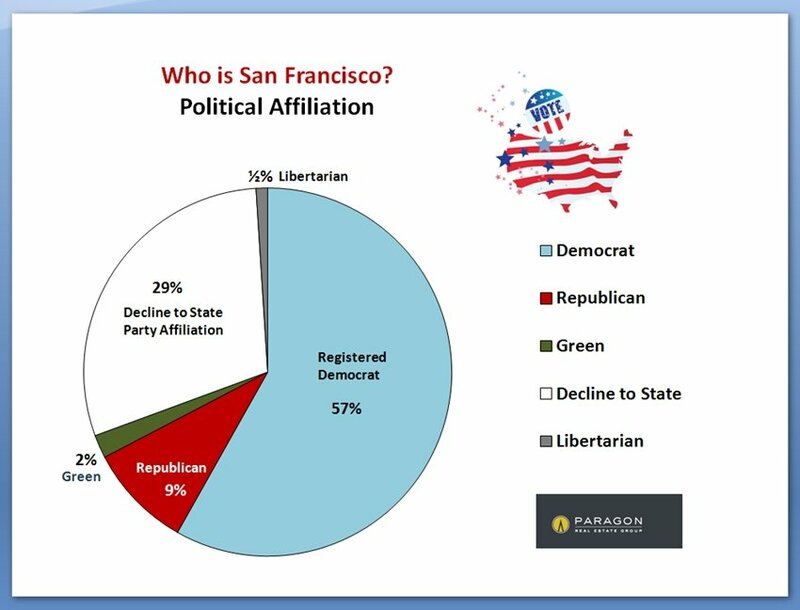 Click here for our full report.